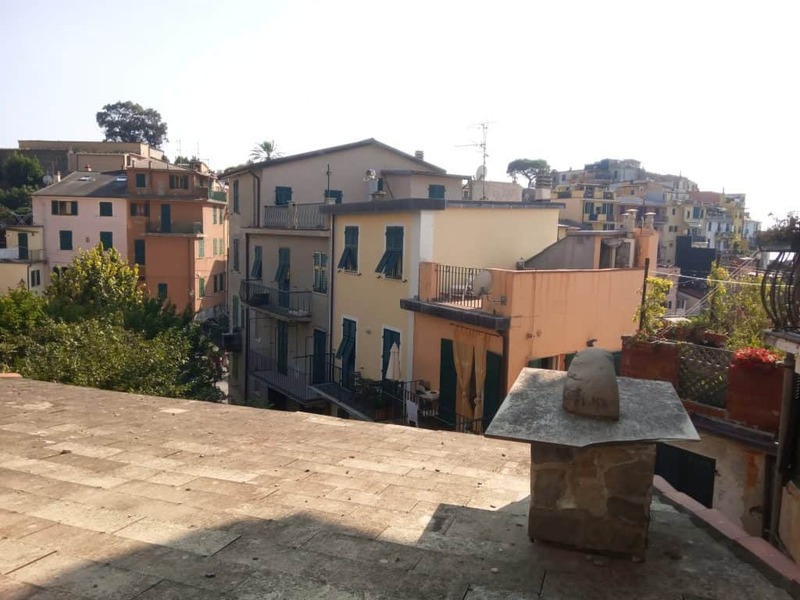 I remember at a period that I was sharing the flat in London with many Italians was the first time that I learned about the existence of this place. 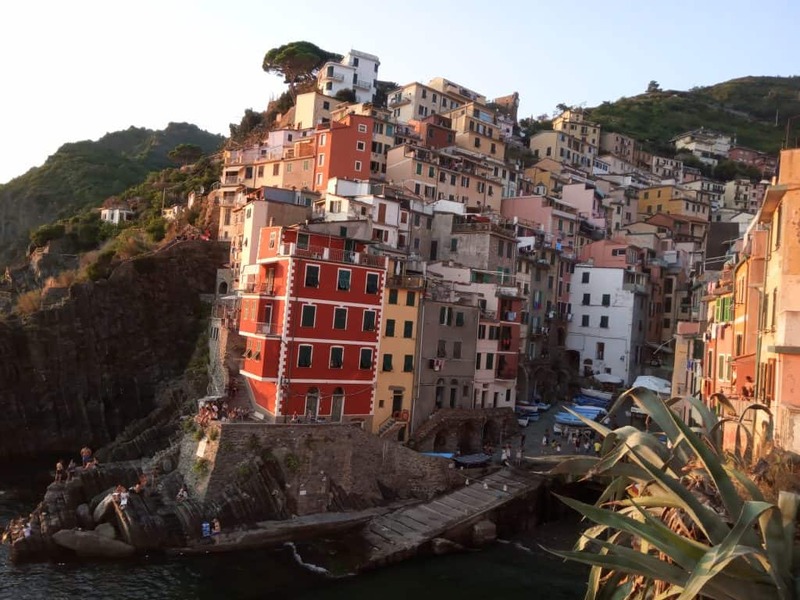 It’s not specific in my memory but I recall being struck when my eyes fell on a photo of these incredibly picturesque and colorful houses standing at the edge of the rocks. 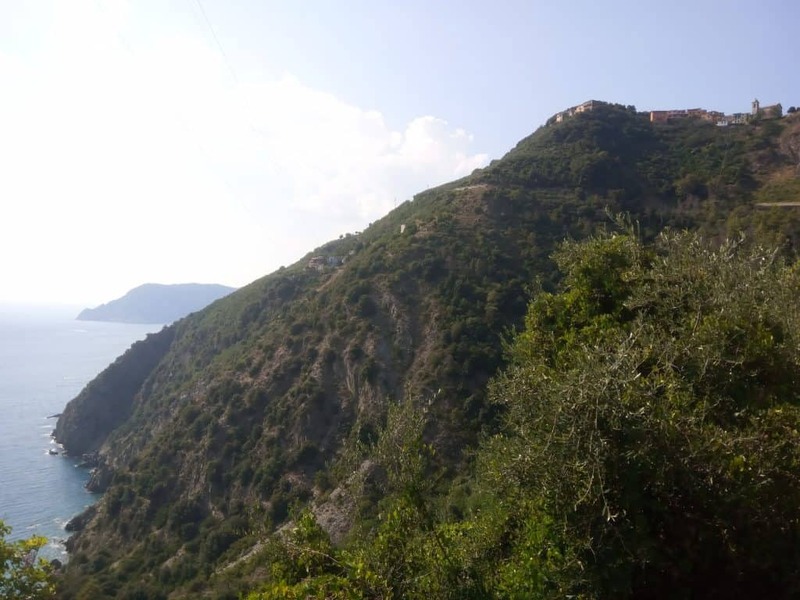 First of all, how could they be built and not have fallen after all these years, it’s so steep there! Till that moment from Italy I had only visited Rome and generally, my impressions about the country were connected with Roman history and nice beaches but not at all with that kind of architecture. Obviously, I couldn’t avoid putting it in my bucket list of trips. First of all there are several places in the aforementioned bucket list but most importantly I feel there is no need to pressurize things. 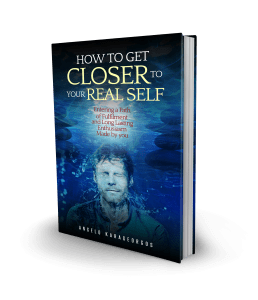 In life I am trying to – on the one hand – have clear pursuits but on the other hand to not be attached to them, instead, I wait for when the opportunity will arise and at that time I am ready to grab it. 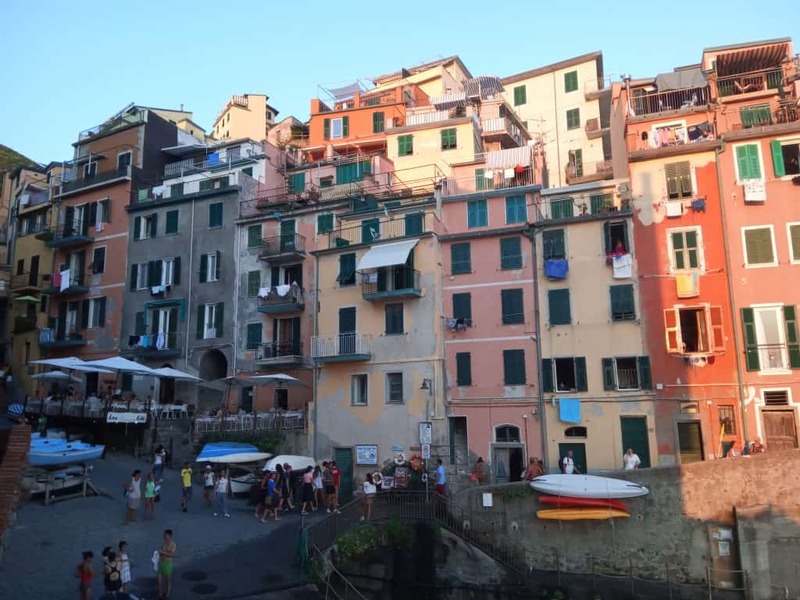 So only very few years after that love at first sight, while several other places of my bucket list had been visited in the in between, the opportunity to meet Cinque Terre arose. 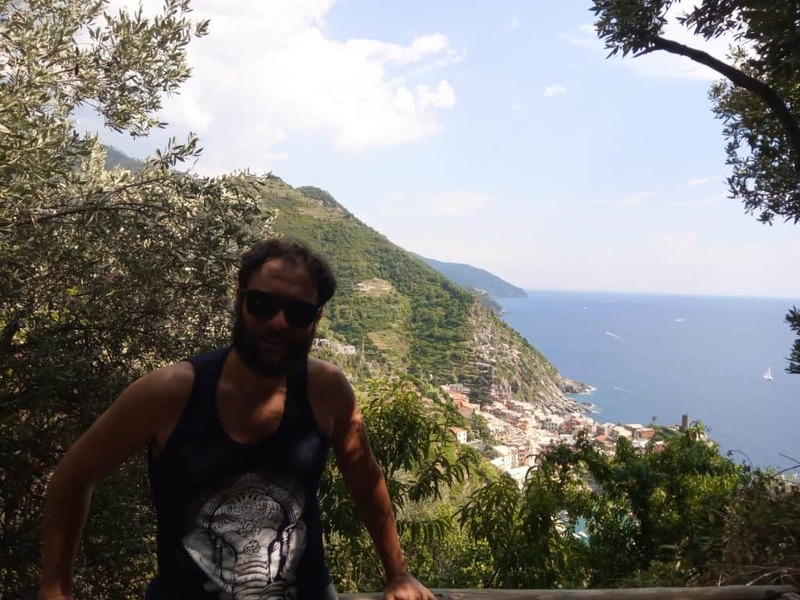 When I was booking tickets to visit Greece from London for the summer of 2018 I found that for my return to London the two flights from Athens to Genova and then from Genova to London with a stay of 5 days in Genova were cheaper in total than a direct flight from Athens to London. 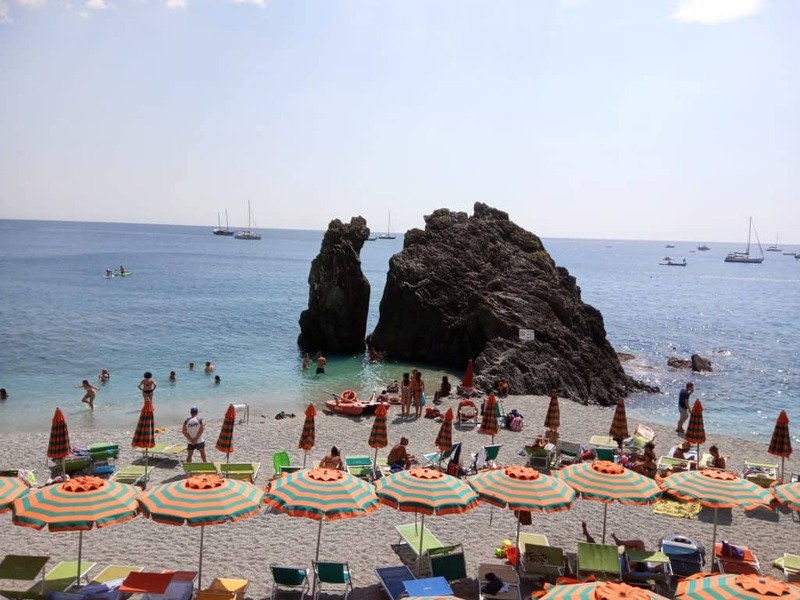 Unavoidably, it was the opportunity I had been waiting for Cinque Terre as it is less than an two hours away by train from Genova plus I would have the opportunity to see Genova about which I had heard many nice things or the famous Portofino. 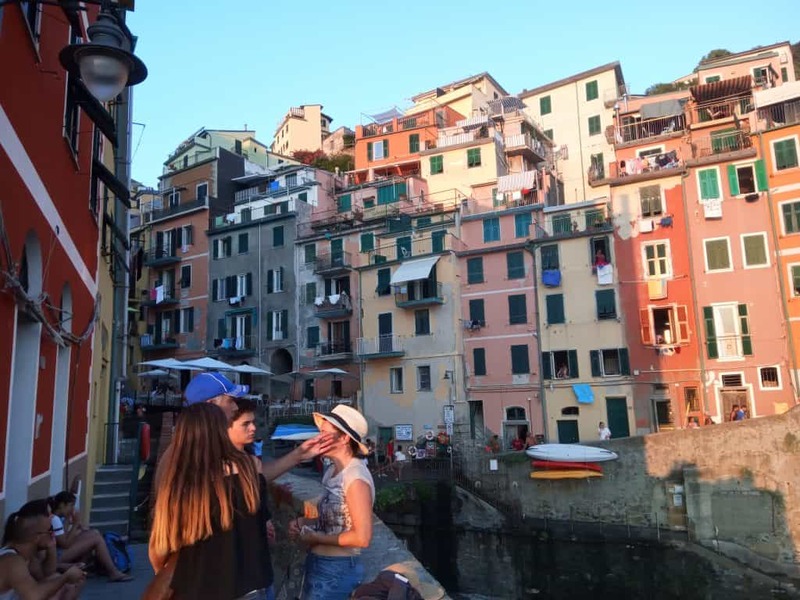 So the program of our visit to Genova went in a way that we left the Cinque Terre for the last day, the 5th. Till that time I had gathered some information about the area. Enough to know what we are going to find but not so much as to be predisposed. This is what I generally do in my trips as I want to be organized however I want, as well, to let the actual experience shape my impressions and not the ideas of others on the internet or photos. 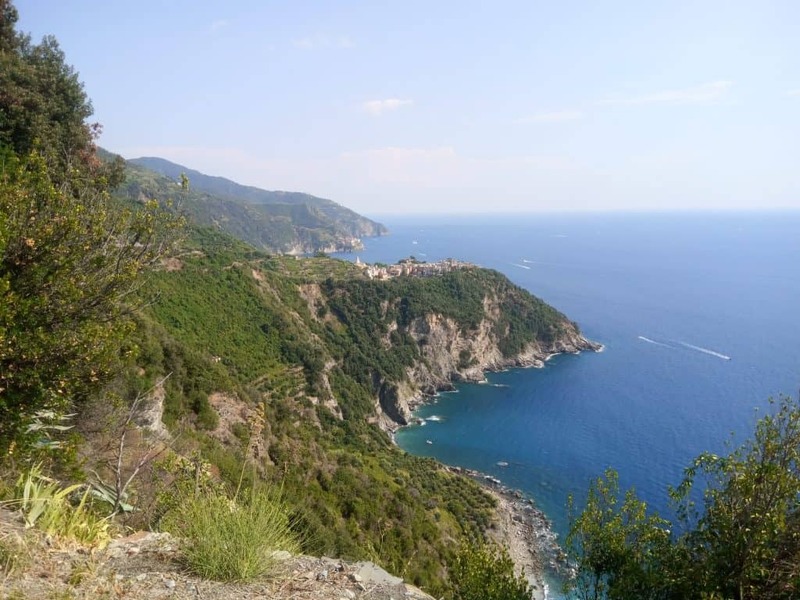 I knew of course that we are talking about 5 villages built on the coast of Liguria. 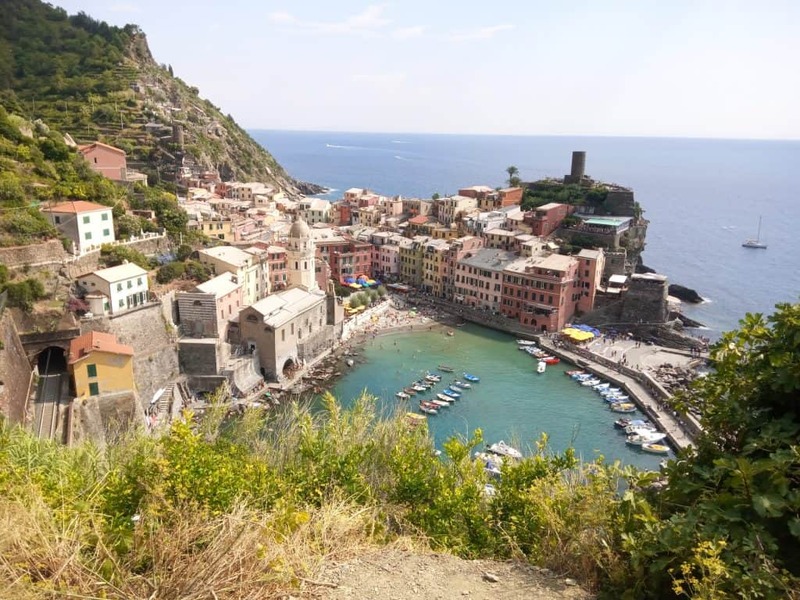 They are Monterosso, Vernazza, Corniglia, Manarola and Riomaggiore. 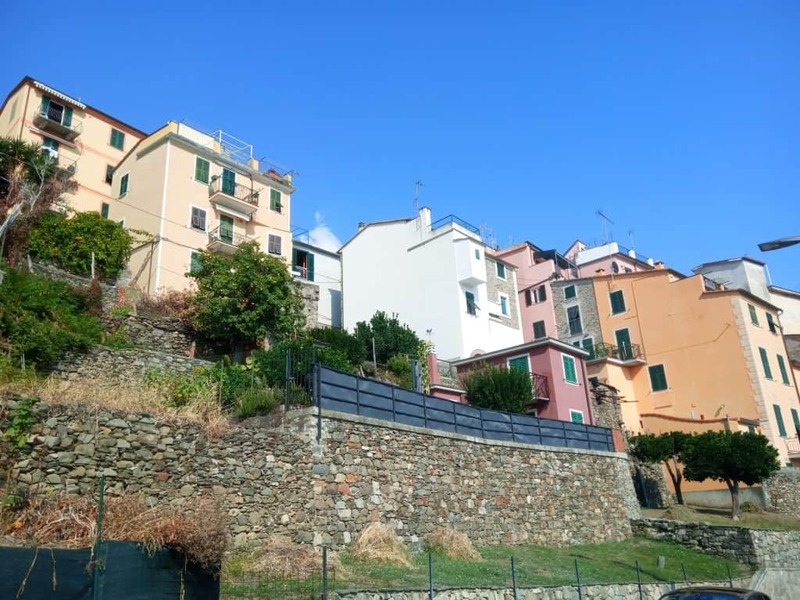 All of them border to the sea apart from the middle one, Corniglia. The villages are connected with walking trails, train and ferry boats. 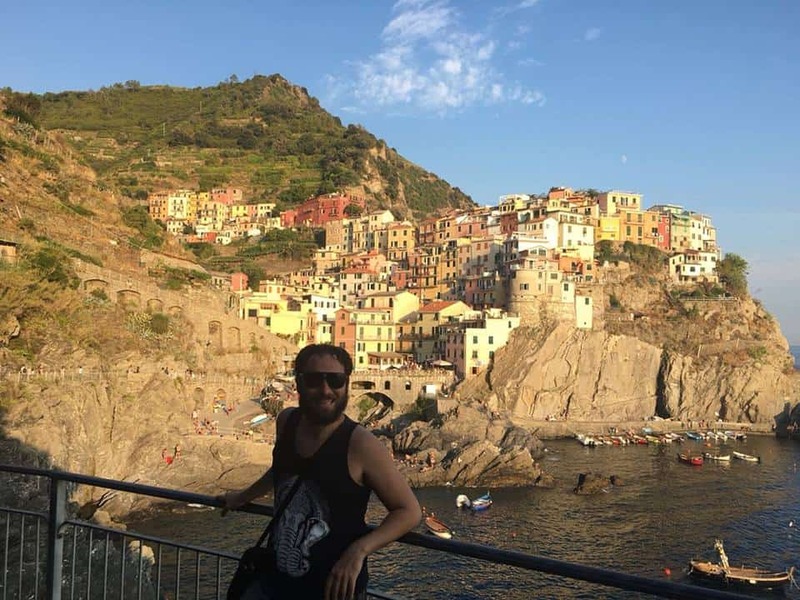 Only Corniglia obviously couldn’t be approached by boat. 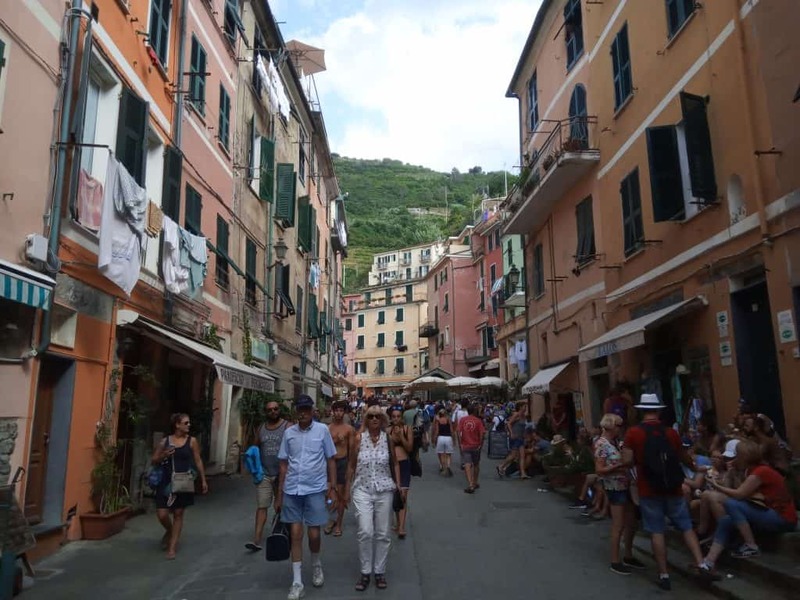 The plan was to take the train from Genova to Monterosso, pass through all of them on foot and take the train back to Genova from Riomaggiore. 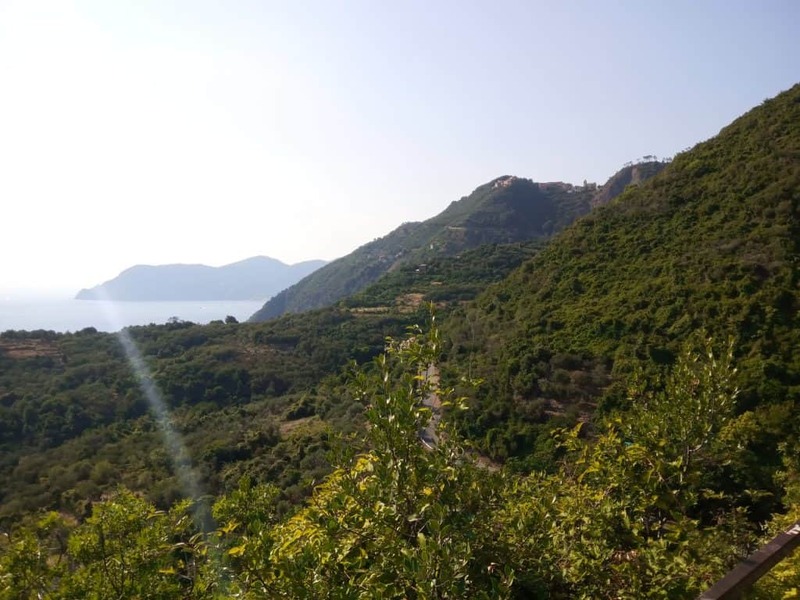 I knew that it would be a long hike that would last at least 5 hours if we avoided the long stops while the sun was really bright, no clouds were in the sky and the temperature was very high (more than 30 degrees of celsius) as it was just after the middle of August. That’s why I was thinking that maybe it wasn’t the best idea to leave it for the last day since we had been tired from much walking the previous days. On the other hand, it was the last day of the trip and of a long summer and I and my girlfriend Niki were committed and enthusiastic to give our best for this long-expected experience. So in the morning of the 21/08/2018 we have had enough sleep in order to be fresh for this long hike. 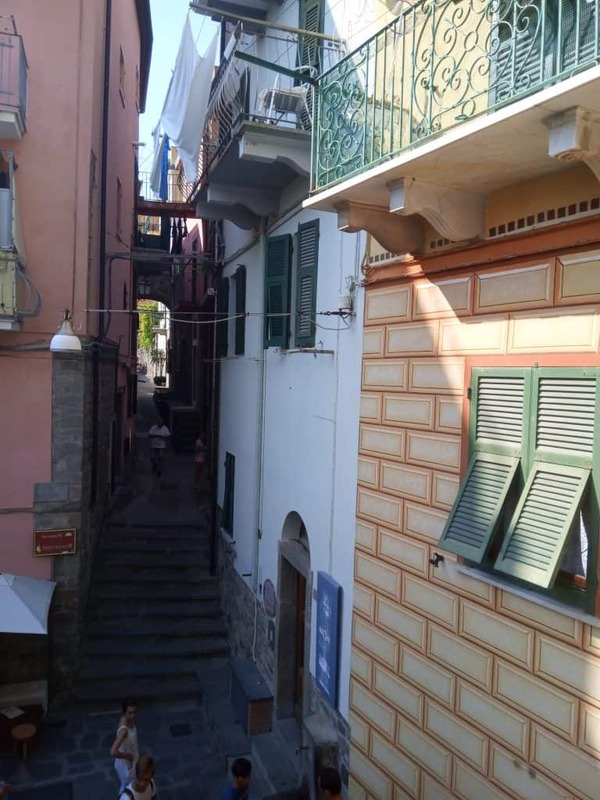 After a quick espresso we took the train from Piazza Principe of Genova (we were staying close to there, next to Santissima Annunziata del Vastato catholic church in Piazza della Nunziata), we changed in Genova Brignoli and fortunately, without much delay, we arrived in Monterosso. 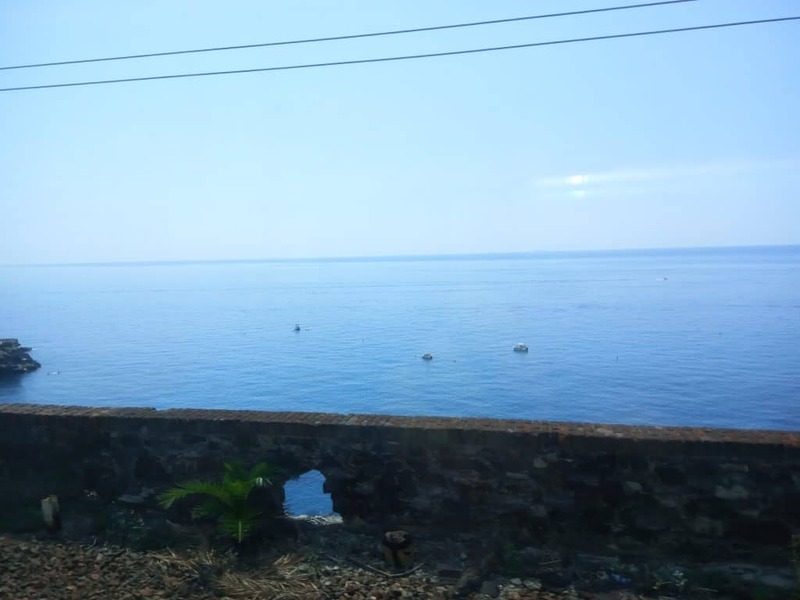 The route with the train was beautiful as well, it was going next to the sea and the Ligurian Riviera for the whole time so on purpose, we chose a seat on that side. 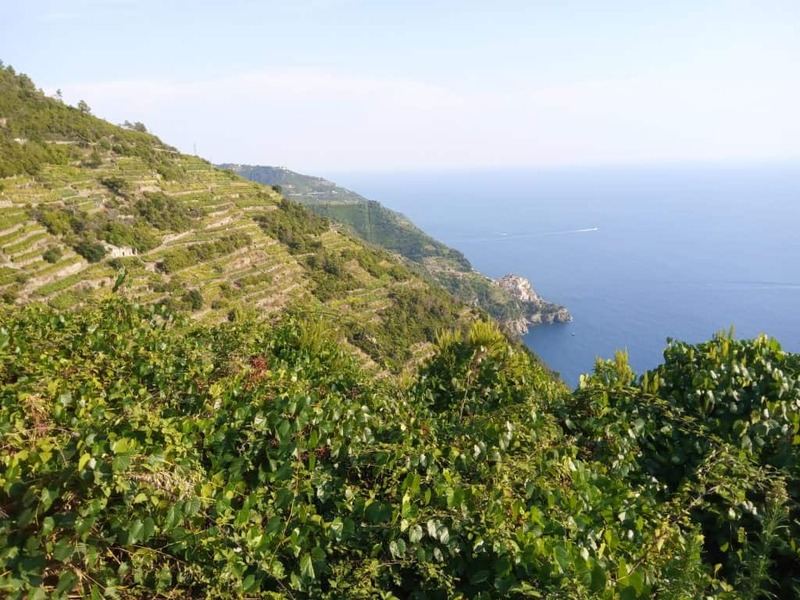 We also passed from several outstanding places like Boccadesse, Nervi, Santa Margherita, Rapallo, Chiavari, and Sestri Levante among others thus the route was not a bit boring. 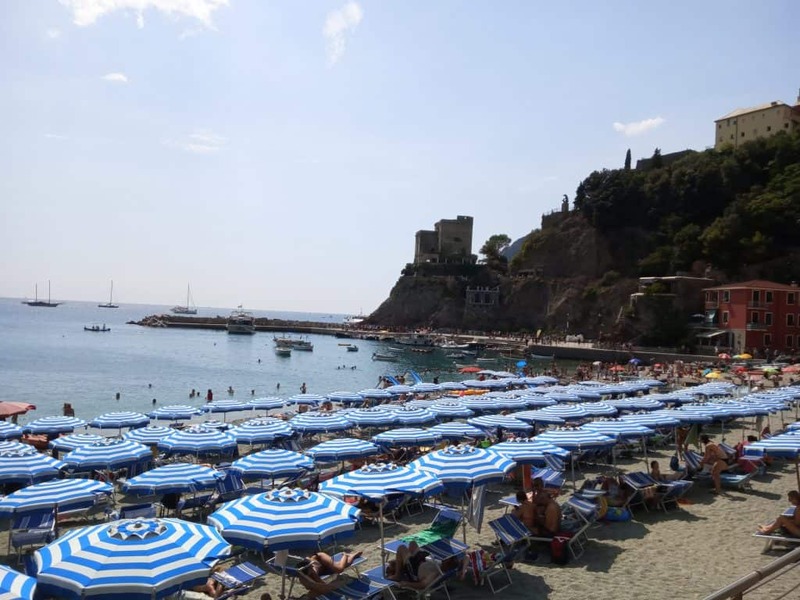 In Monterosso, the train station was full of people and looked renovated. I immediately sensed that this place is quite popular while its popularity was increasing hence the renovation. At the same time, it was right next to the beach, immediately after getting out of the station was a pedestrian road going parallel to it. Contrary to what I was expecting the beach was long. 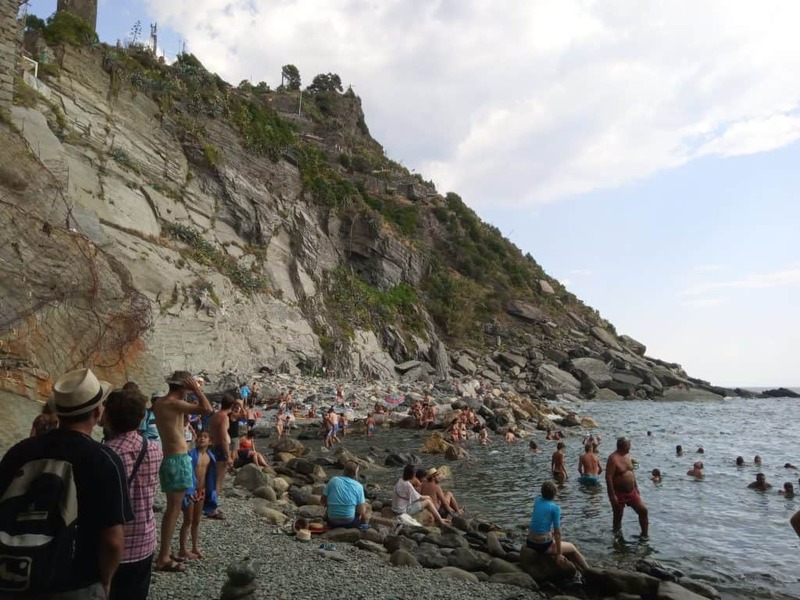 The other places of Liguria I had seen the previous days had narrow beaches and most of the times it was just rocks. I had understood that this is a characteristic of the area. 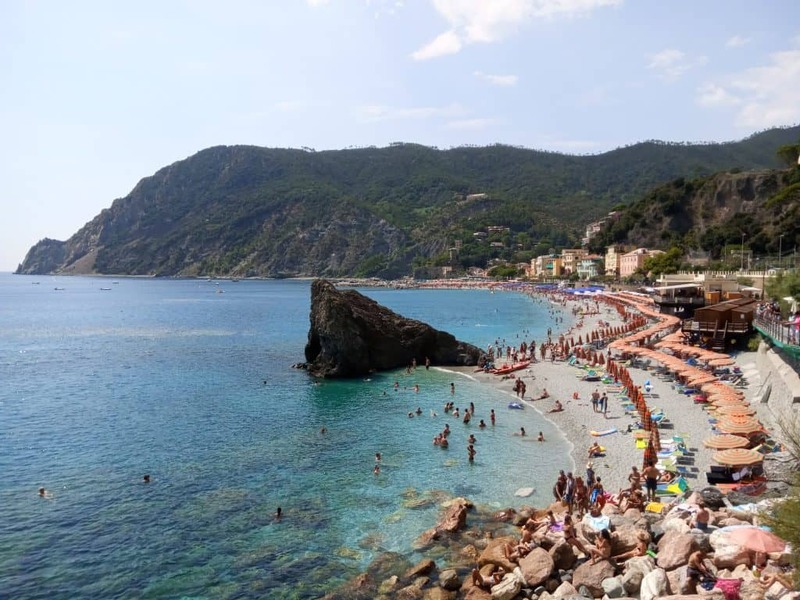 However, Monterosso looked different. That’s why maybe the place was full of people and so did its sandy beach. As I was looking at the sea, though, I was already impressed. Blue waters as I have been used in Greece, a big rock in the narrow waters was making it exceptional while both on my right and left-hand side I could stare at magnificent green mountains. As well plenty of boats were anchored or were sailing. The first thing I was looking to find there though was a tourist information center to ask some basic questions about the route. How would we know which route to follow? Were there good signs on the road or we needed a map? How long is it expected to take? Are there many different routes and if yes which one would be most appropriate so that we see all the 5 villages in the same day? And generally if there is anything else that might be important to know. We kept walking next to the sea. Not far from there we passed from a big rock that behind it appeared another beach, much more narrow and once again full. 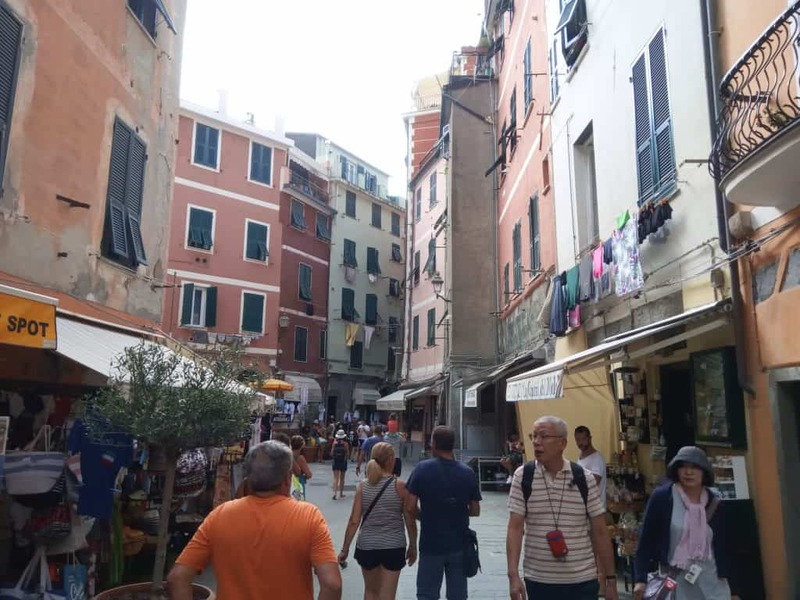 There was also a small square there with touristic shops. 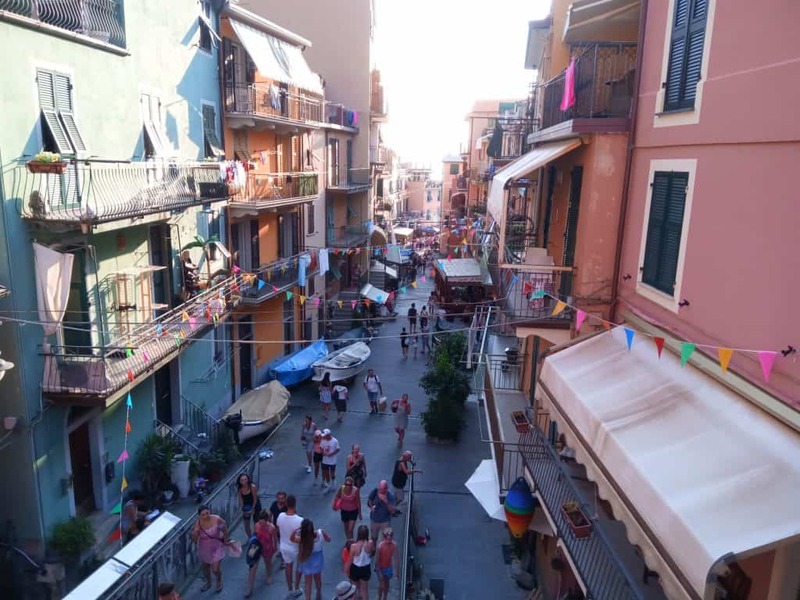 Next to the beach was a desk selling tickets for boat trips. Of course, this was irrelevant to us as we were planning only to walk. However, it also had tourist info. I went there and asked about the route. 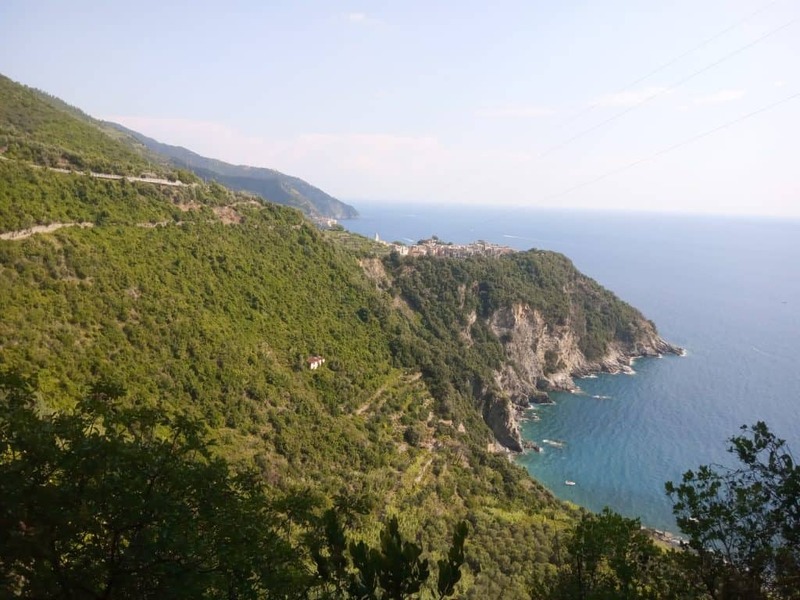 The lady told me I had to keep going on the route that leaves Monterosso. 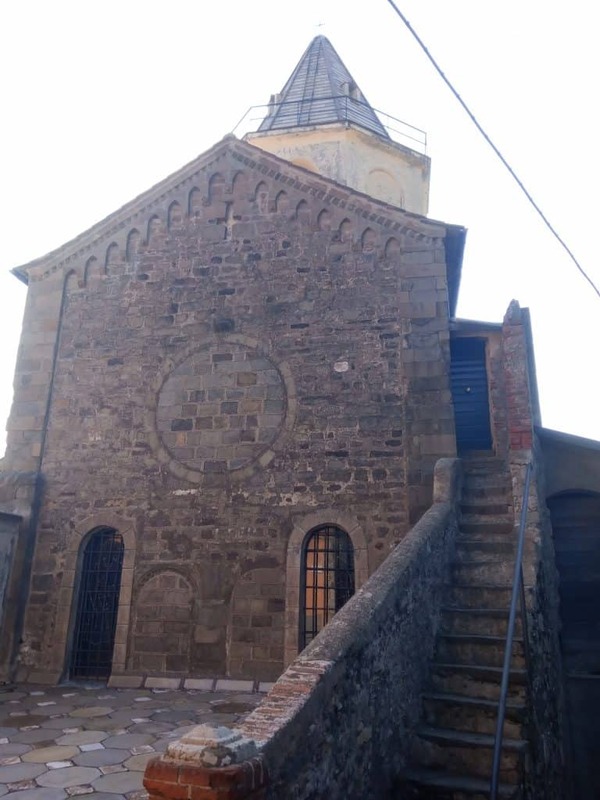 In the photo above you can see it on the left hand side going upwards. When I asked if it is easy to follow it and reach all the other 4 villages on foot she laughed loudly. She replied with gurgling eyes “Easy?” and laughed once more. However, I explained that she had gotten me wrong. I knew the route is long and definitely not easy as it has many ups and downs. I meant if it is easy to find the route and then she replied affirmatively. So after feeling confident that the way would be easy to follow we were ready to start. As we were leaving the first beautiful village every once in a while we were looking back to enjoy its view. That was it. Another long hike had begun and I couldn’t hold my excitement. Very soon we started moving upwards and the view was becoming magnificent already. 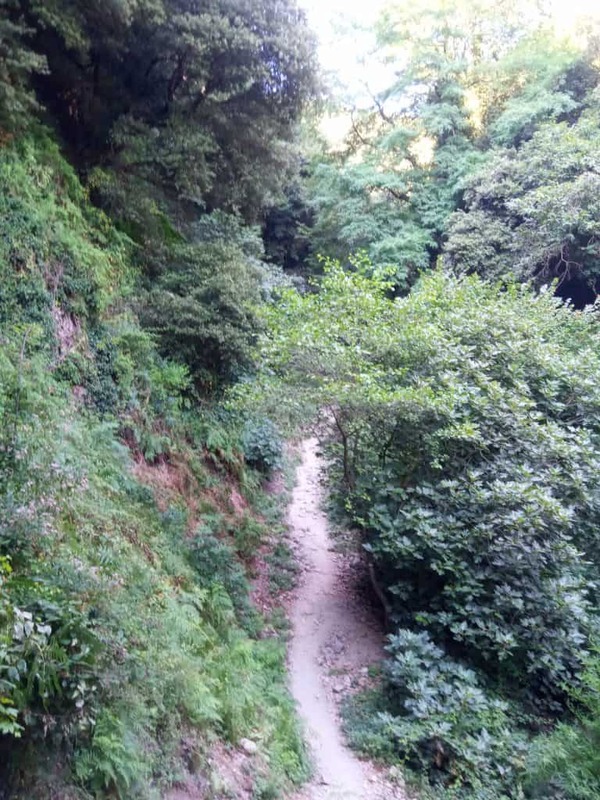 The road however very quickly became extremely steep. It didn’t matter much, though, due to our huge enthusiasm. 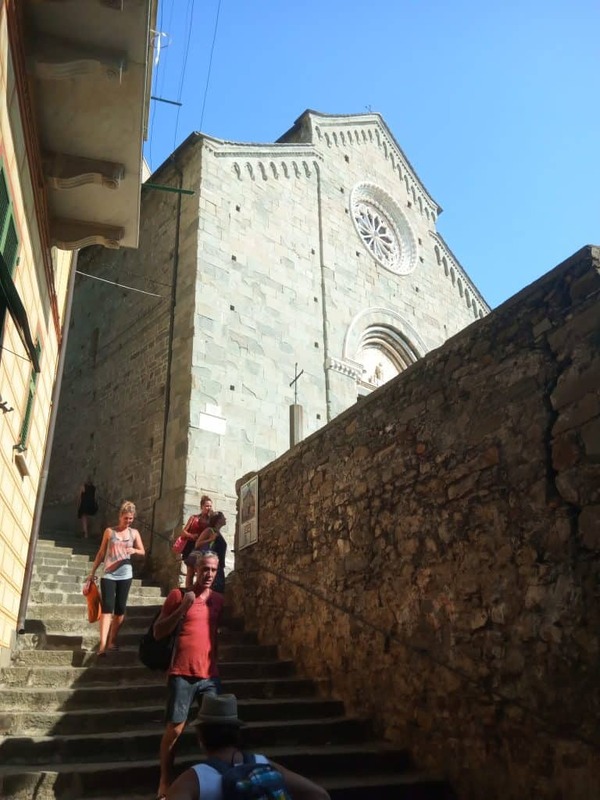 We were almost climbing innumerable stairs while in the in-between were meeting several people coming and going. As well we were passing inside vineyards. After passing on the other side of the mountain we had left pretty much the civilization behind while the views were astonishing. 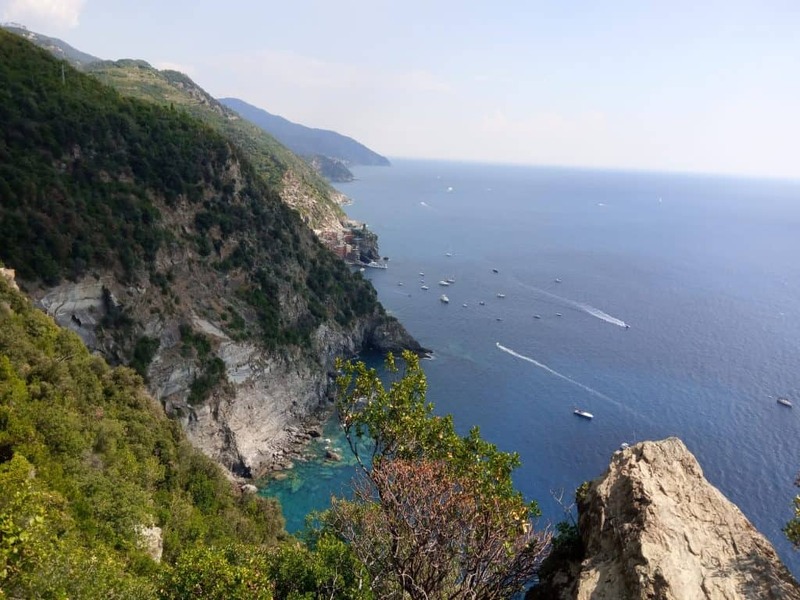 The sea looked gorgeus from this high and I didn’t know if I was in fact looking forward to see Vernazza or to enjoy the magnificent nature! In the meantime, we saw a house in the middle of nowhere. What stories this might be able to tell? 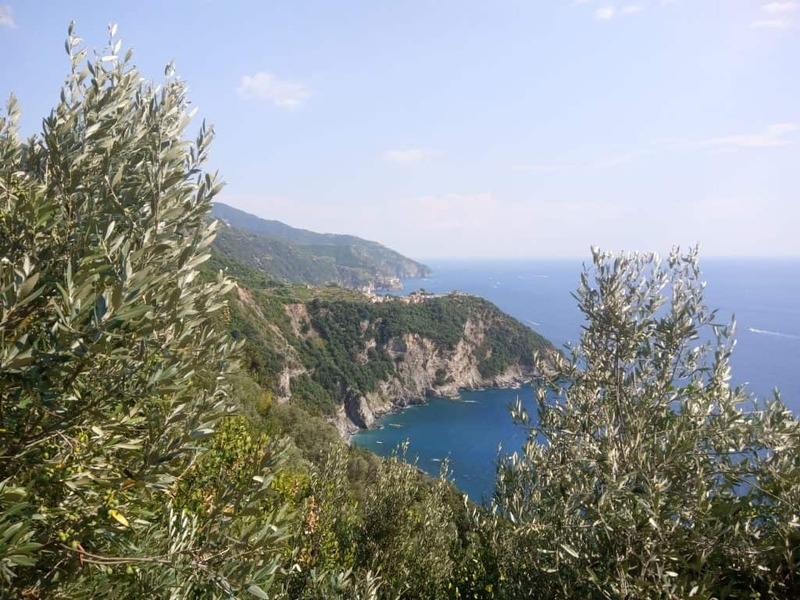 The Olive trees mixed with the bright sun and the turquoise were clearly reminding of my Greece! 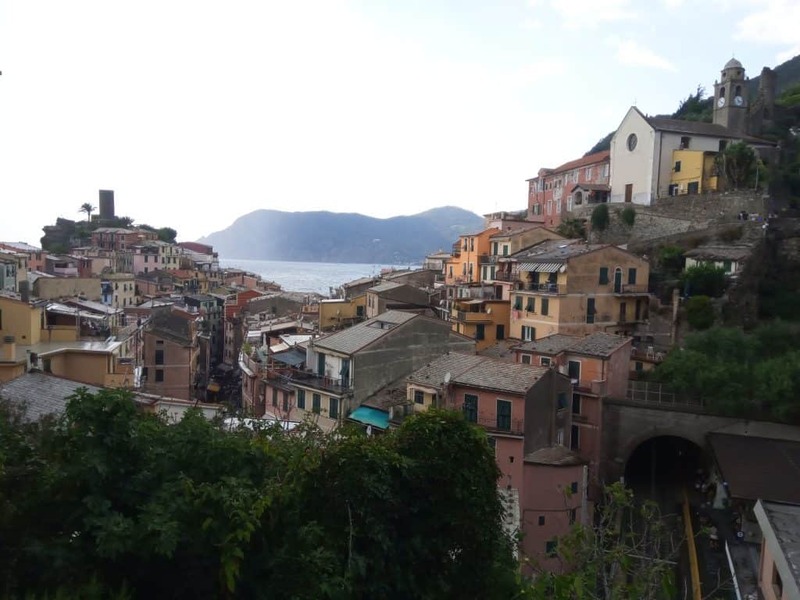 After about 45 minutes of walking in such an environment, Vernazza appeared from far away! Gradually the road started descending. 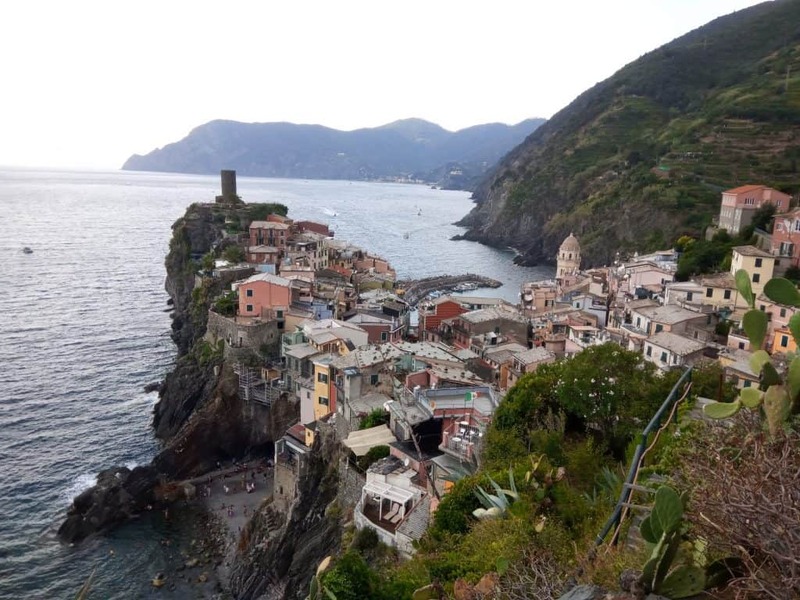 You see we had to reach again the sea level where Vernazza is. 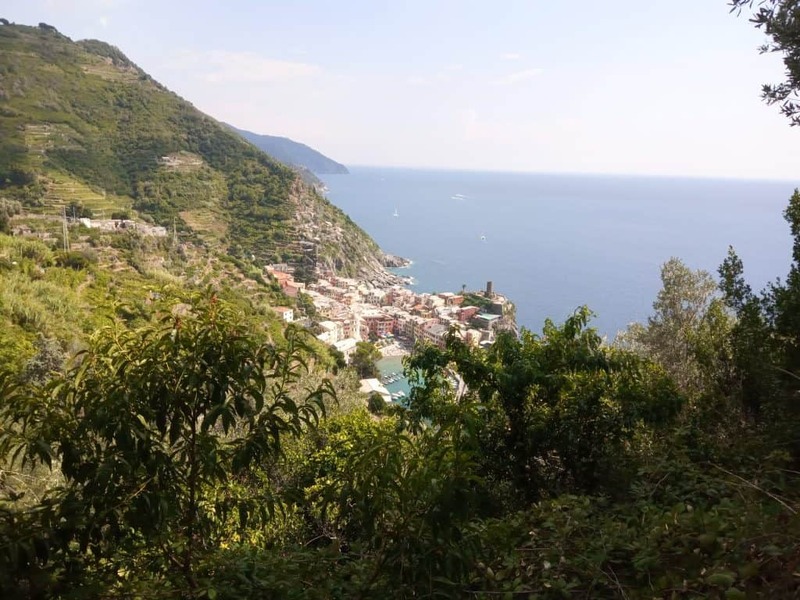 One reason the Cinque Terre hike is hard is this; that in order to go from one village to the other you have to go from the sea to the mountain and then to the sea again. 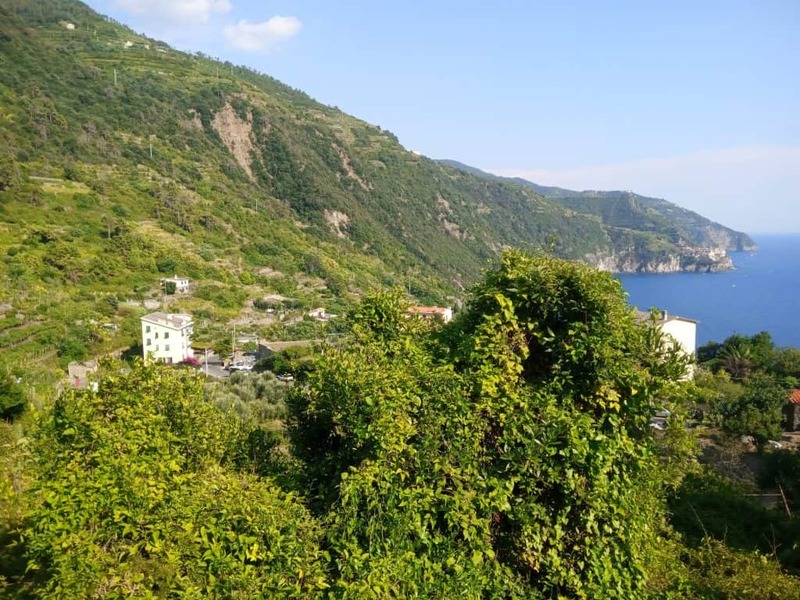 As I mentioned, only Corniglia doesn’t border to the sea but I will explain later why the route from there to Manarola was the hardest of all. 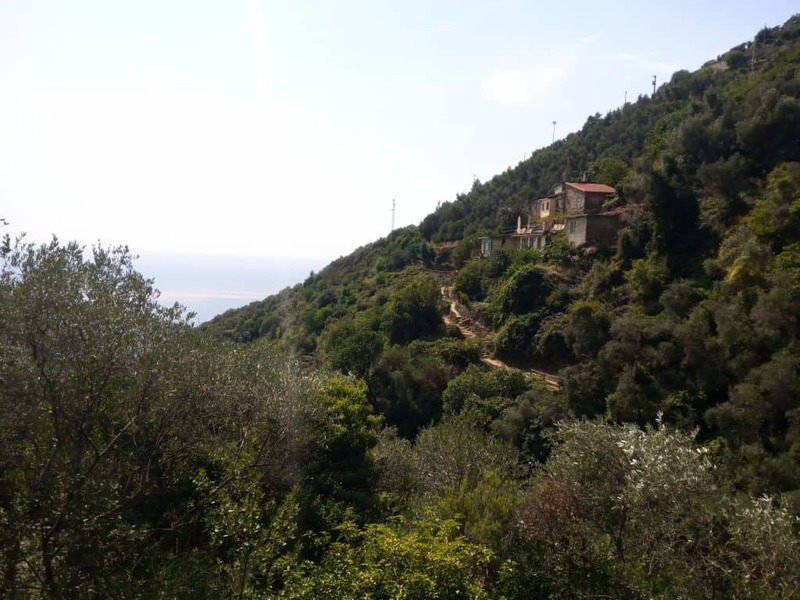 So we kept walking in the mountains, among the trees and next to the sea. 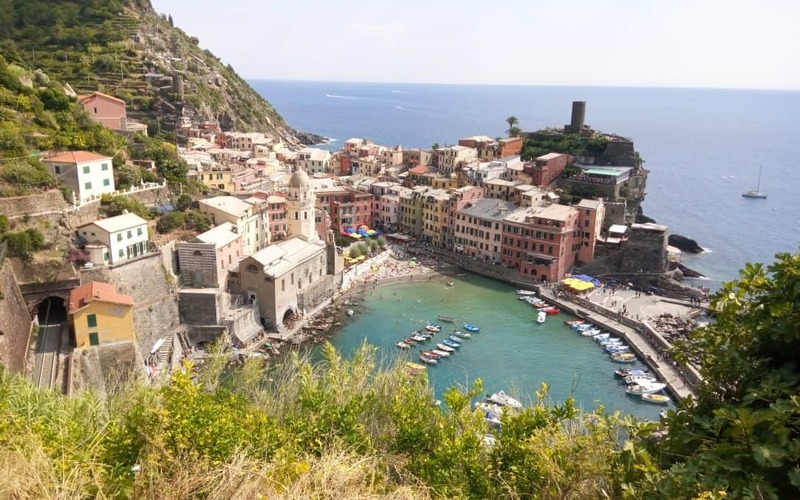 After less than half hour in an opening Vernazza appeared much closer this time. It looked so beautiful and unique! I couldn’t, of course, miss taking a photo. 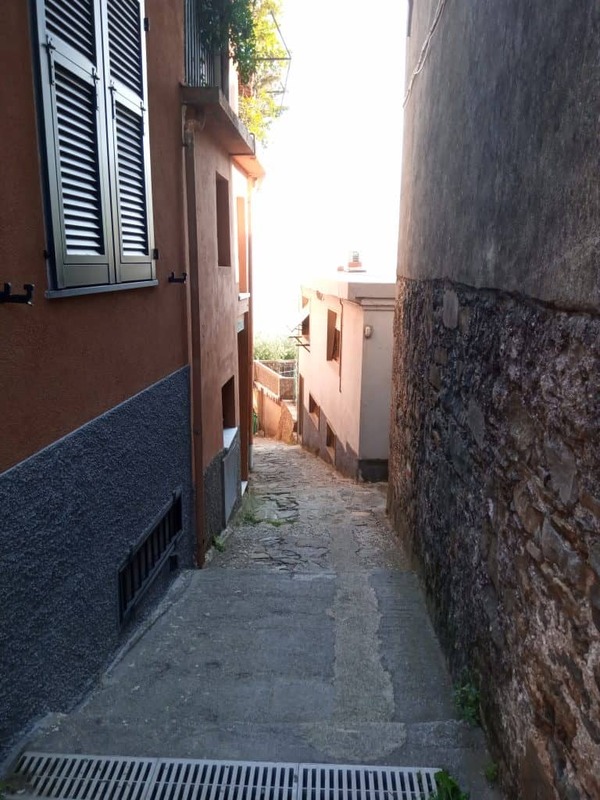 As we kept walking the route was becoming once again very steep. We were so close and we were enjoying fantastic views. Very soon we were inside the village, I couldn’t stop my feet from running! 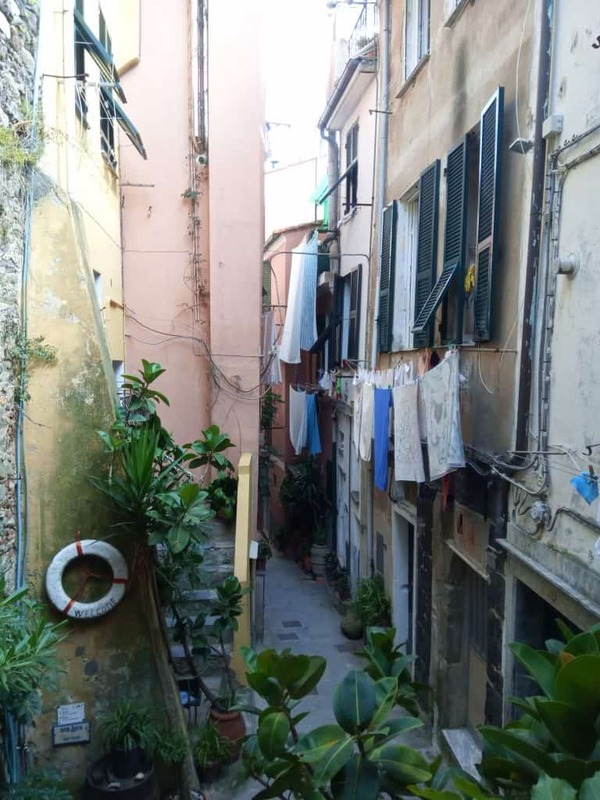 Colorful tall houses, narrow streets and clothes hanging outside. 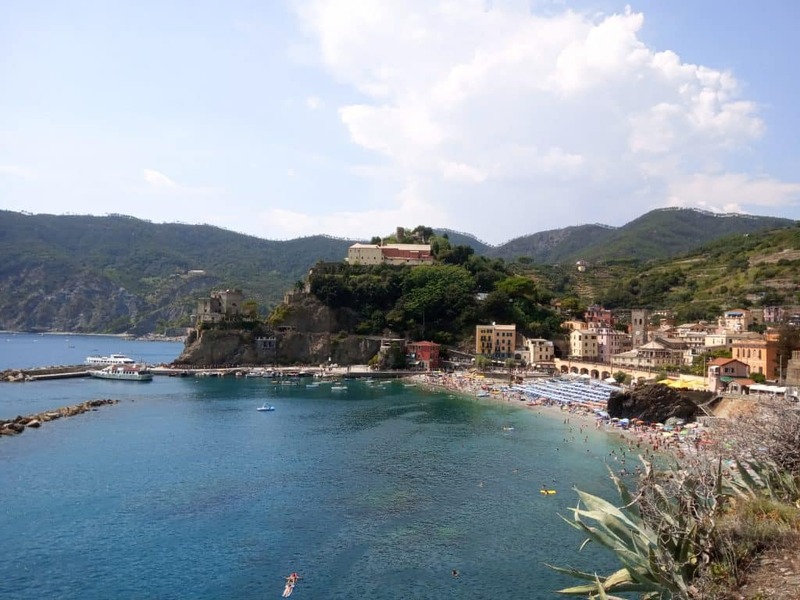 Typical Italian Ligurian magnificence! Of course, we were in an emergent need for water while we reached the main road which was full of people and looked really pretty. 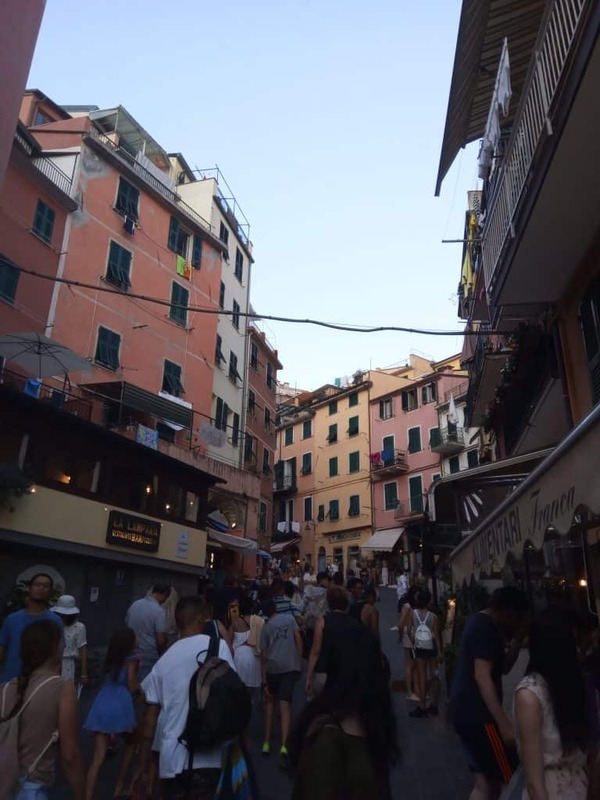 After satisfying our thirst we decided to give a little time to see Vernazza. We had a long road to go still however we couldn’t miss gathering some impressions from there. 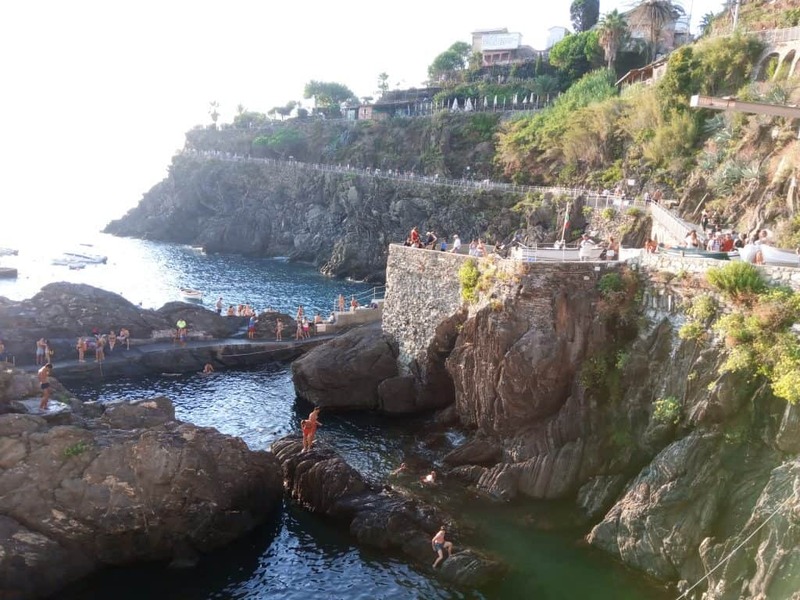 In the end of the main road there was a passing through a rock that was leading to a small beach. 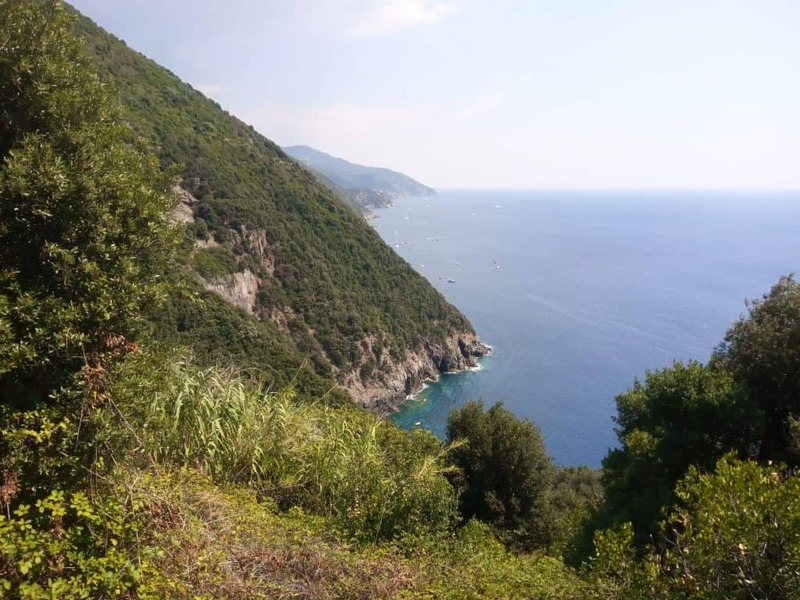 This was typical Ligurian. 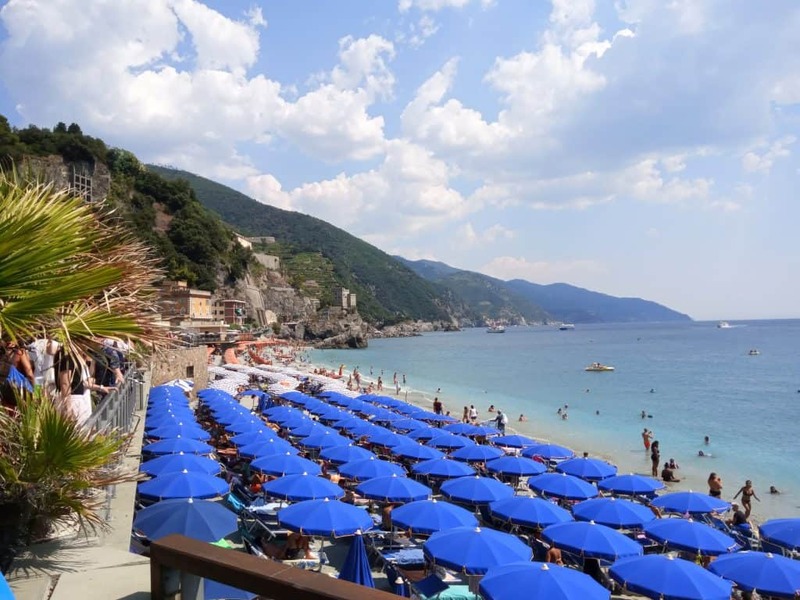 The unexpected thing was that although the whole time it was very sunny, as we reached this beach it suddenly started raining, not heavily though. It seems there was a cloud passing. We returned to the main road but I didn’t cover myself. I really needed this summer dewiness and I knew that soon the rain would be over and my few clothes would be dried up. 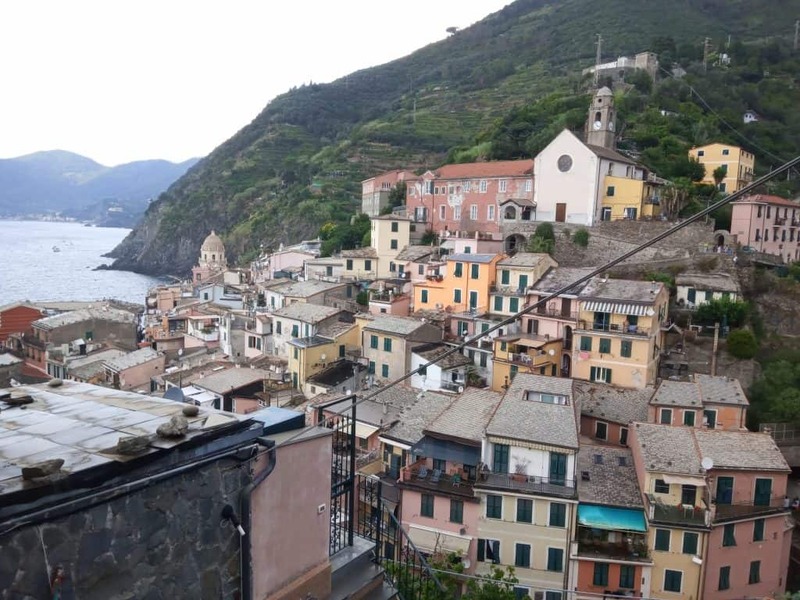 I think the rain didn’t last for more than 10 minutes and in the meantime, we had started getting away of Vernazza and once again climbing back to the mountain. 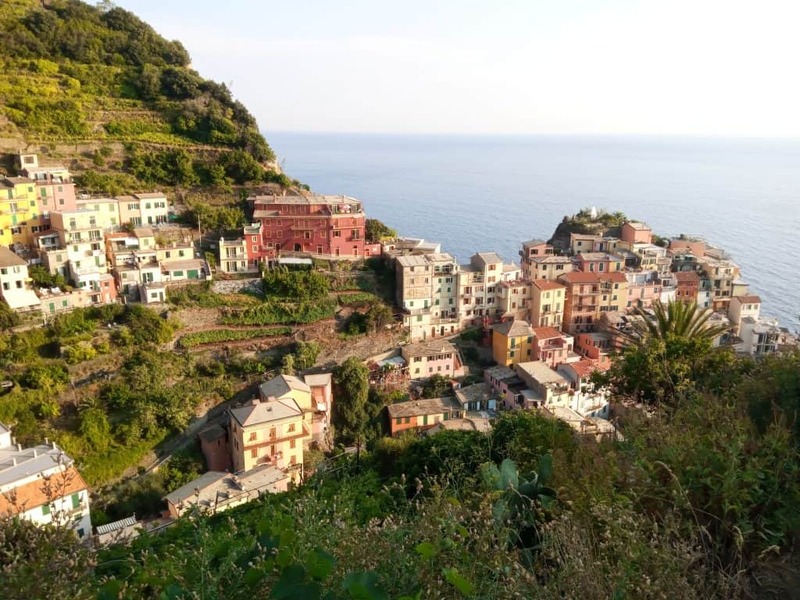 Of course, we couldn’t miss looking back and enjoying the splendid views of this side of this traditional Italian village. As we were moving upwards it was looking really cool! On the image above here on the down left, you can see the small beach we were when the rain started. The clouds had started going away although the sky was still a bit dark. 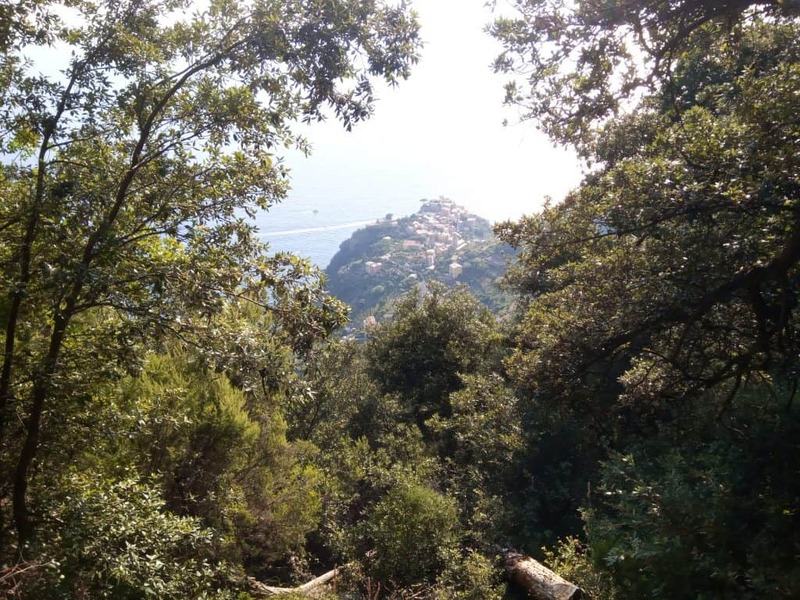 As we continued the hike up the mountain once again we were enjoying astonishing views. 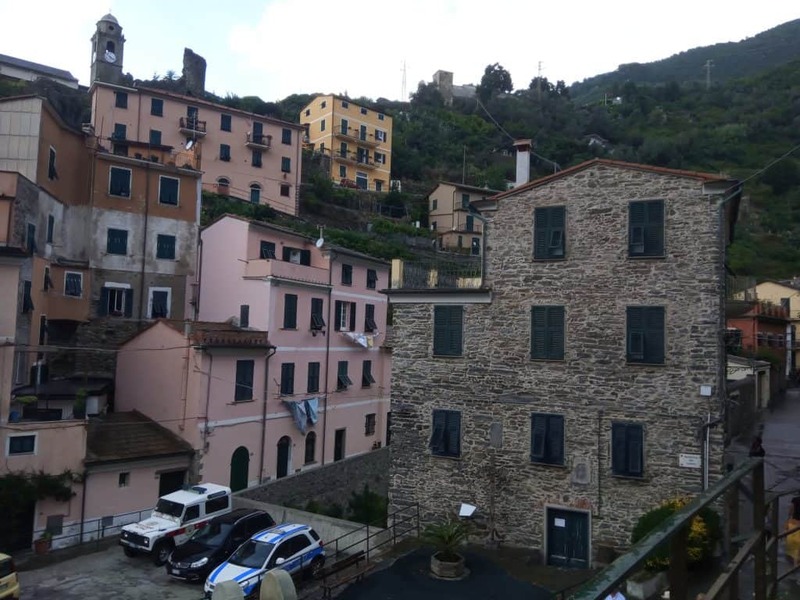 And then turum turum, Corniglia appeared! You can see it on top of the rock. 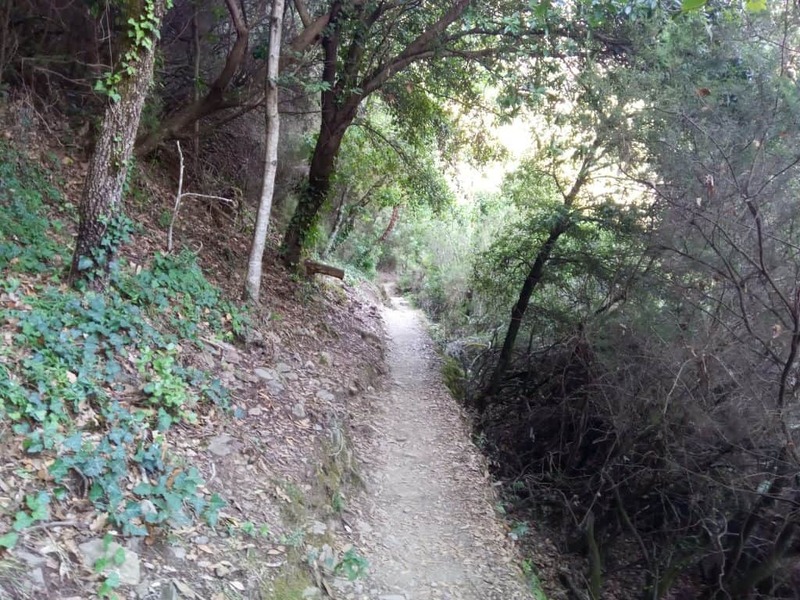 It’s so nice to walk there for hours and gradually seeing the next unique destination approaching. 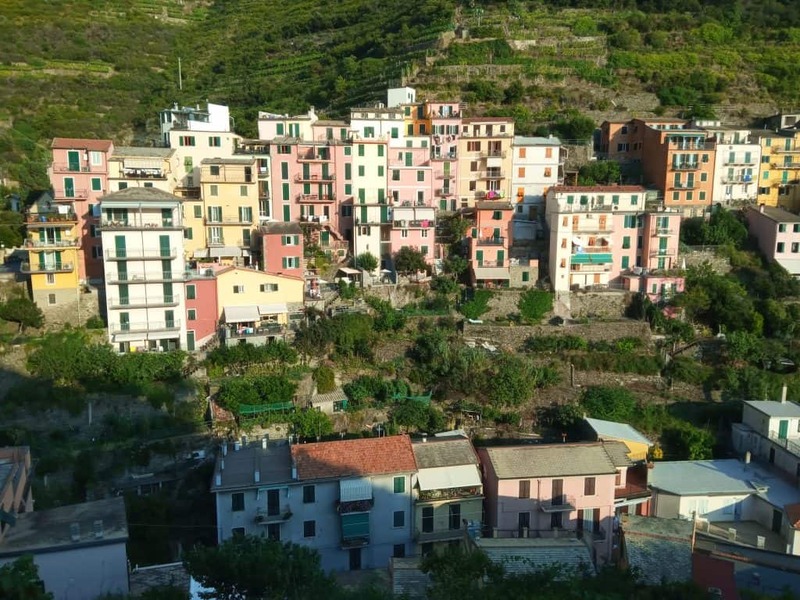 In the meantime, much higher than us we could see another village that doesn’t belong to the Cinque Terre. It’s San Bernardino. 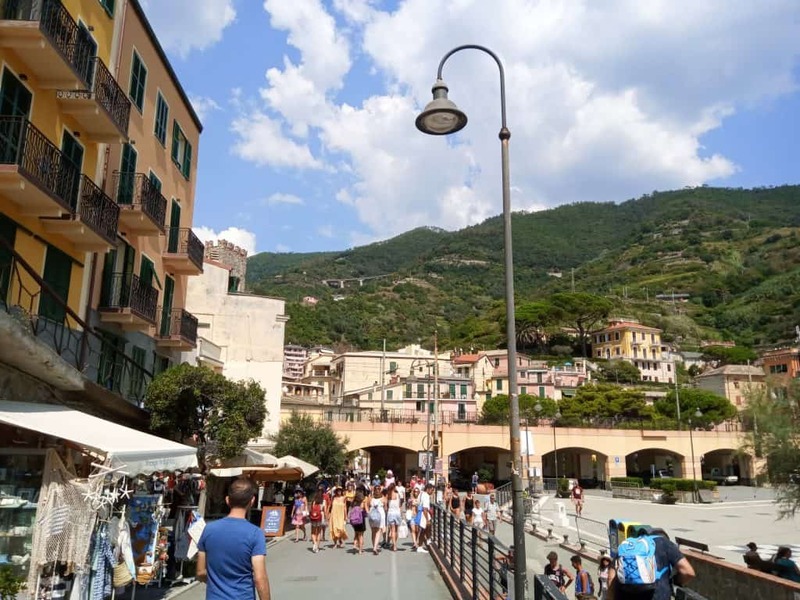 Just outside Corniglia in the shop checking for tickets (there is a fee to walk in the Cinque Terre national park) we learnt that the coastal walking path connecting Corniglia to the 4th village, Manarola was closed. 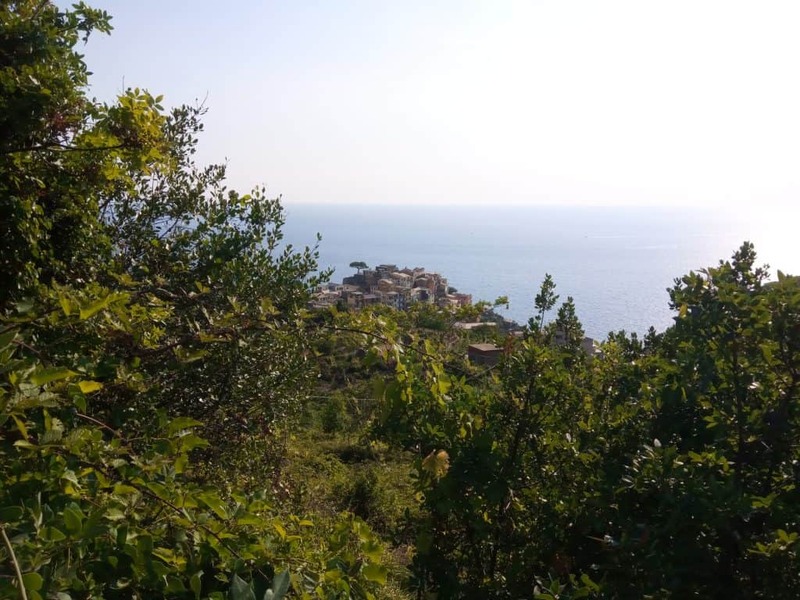 So in order to go on foot and not by train we had to go very high on the mountain, pass from a village called Volastra and then down again to Manarola. This was expected to take about 2 hours. 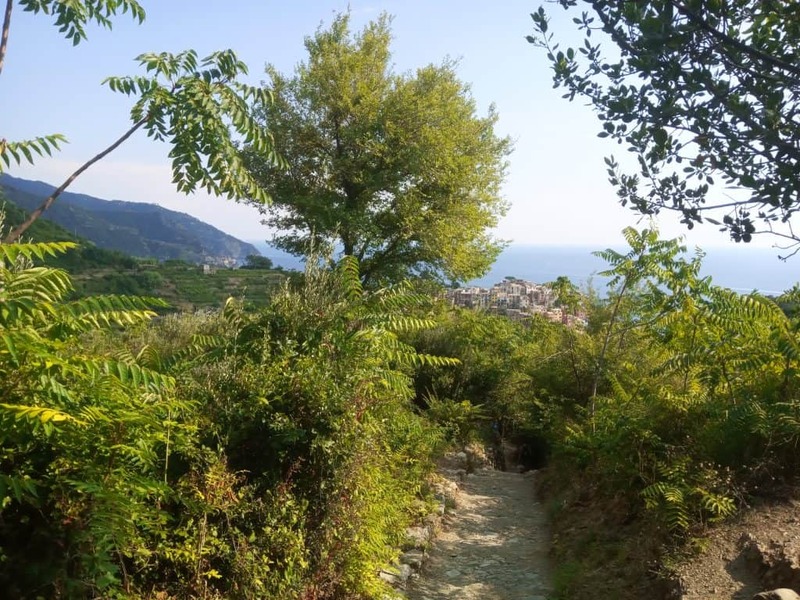 We had to follow the route that was starting from the main church of Corniglia, the church of San Pietro and head up the mountain. 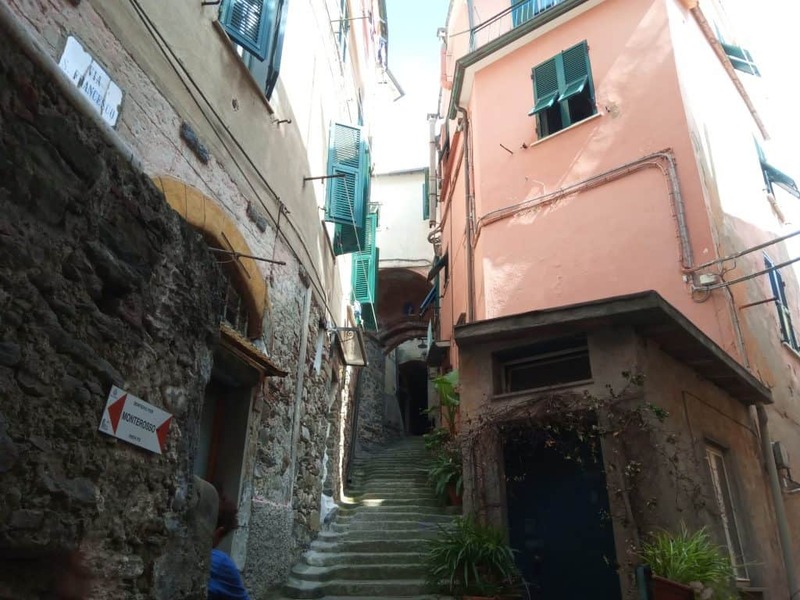 Anyway, we entered Corniglia which once again was outstanding. 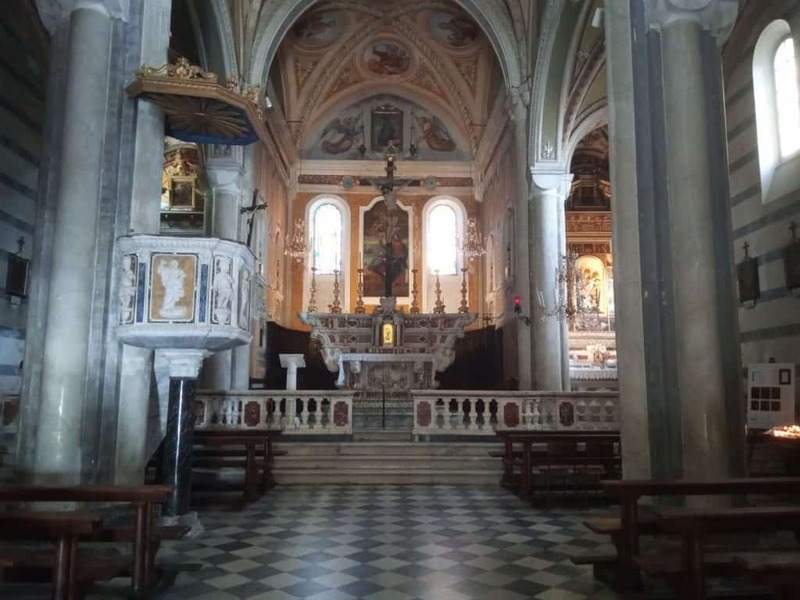 and soon we were in the church. After taking the necessary photos and drinking water from the fountain close there we headed upwards again. We kept going up and up for a long time. 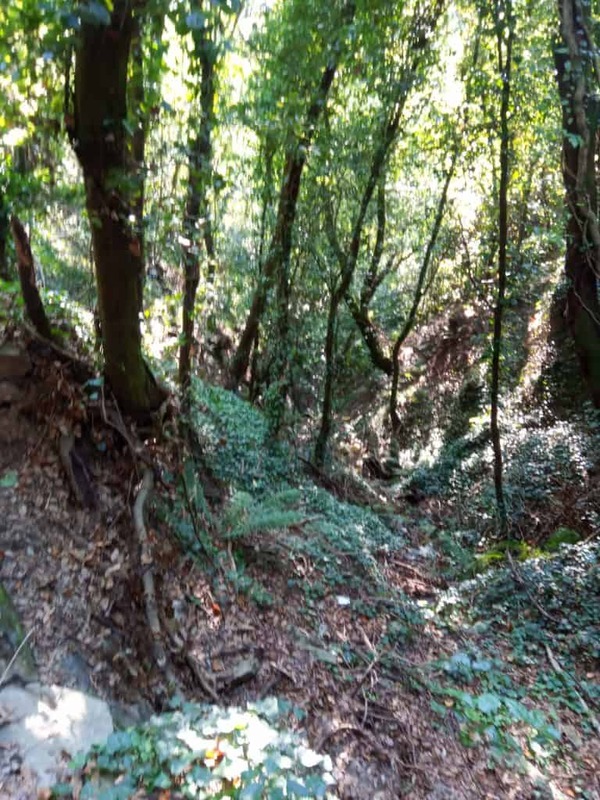 It was by far the steepest we had seen on this hike. We must have been climbing for about half hour unstoppably. 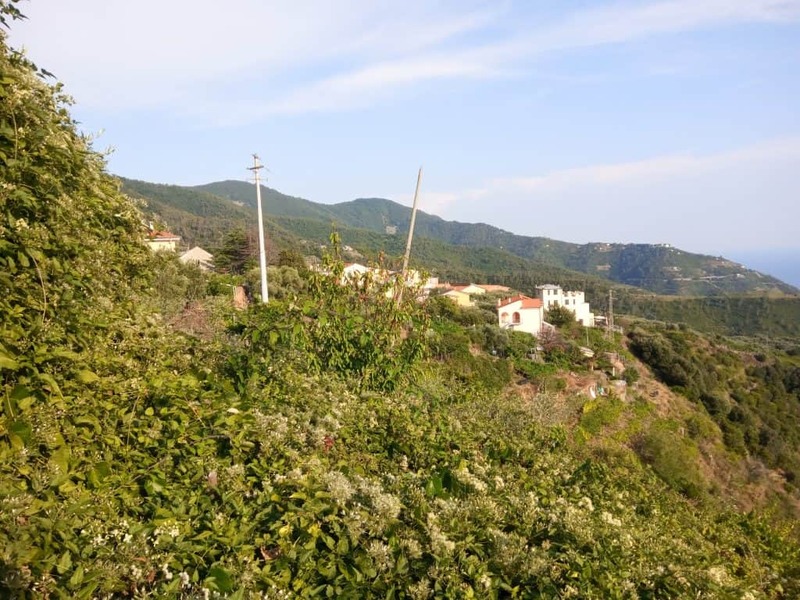 Sometimes we could see Corniglia from far. It’s not a coincidence that the plantation after some time started changing. It was really a mountain there. 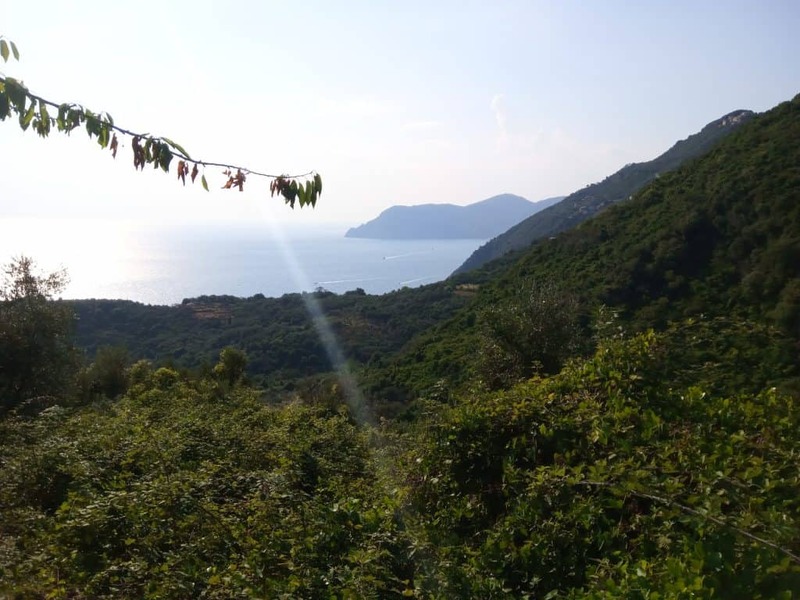 We were walking and walking sometimes under the summer burning sun and sometimes covered by the trees while we would hardly ever meet other hikers there, definitely much less than what we had been used in the previous walks. We had obviously started becoming tired but we were keeping going. 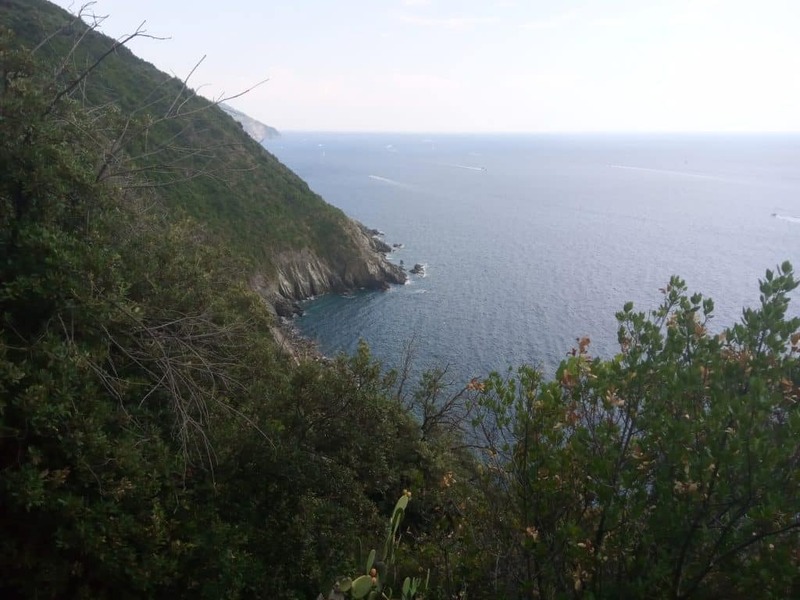 Until we reached the place that made me think all this route in the mountain was really worth it and I would have chosen it even if the coastal path was open. 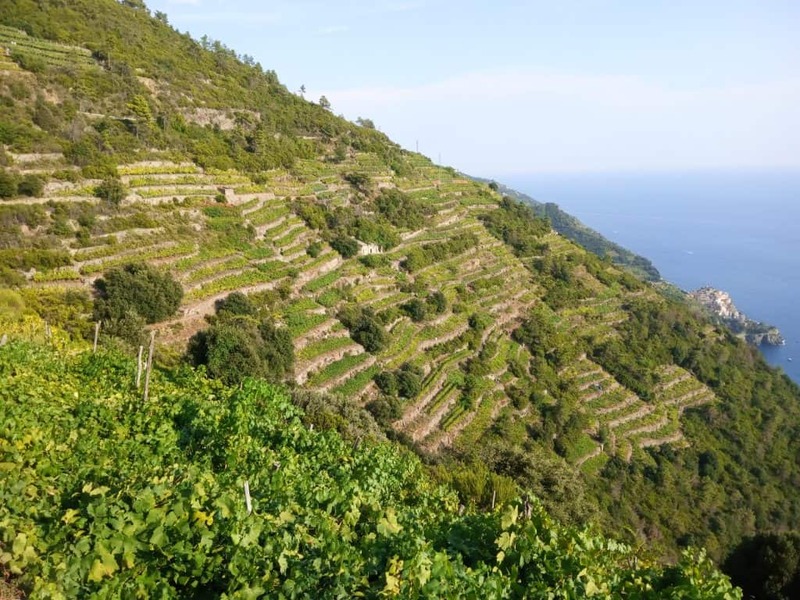 It was the Cinque Terre Wine Terraces! 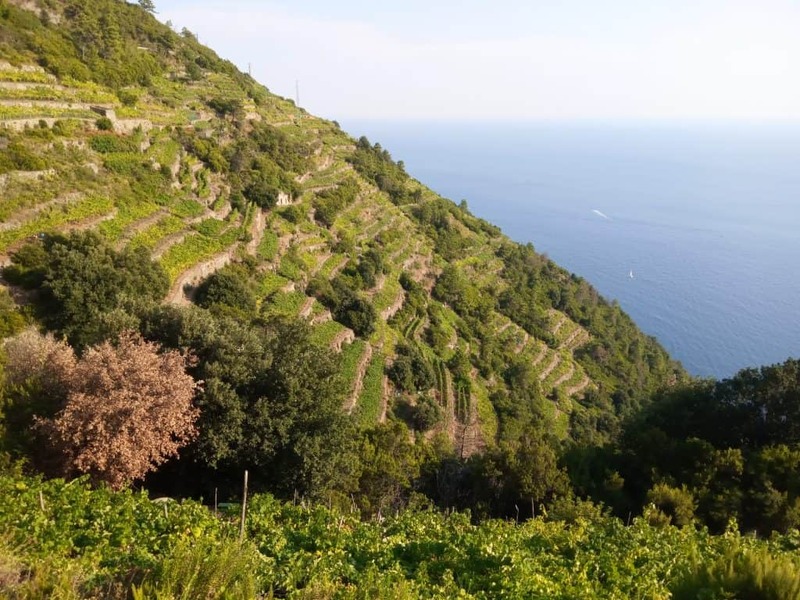 Wine making has been a crucial part of the history of the Cinque Terre. 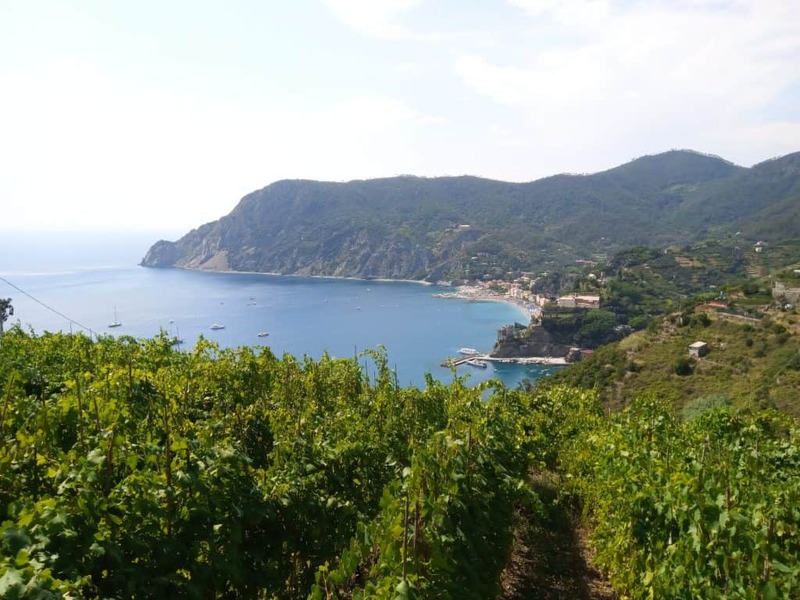 People have been making wine there for about a 1,000 years and the vineyards stretching in many places along the coastline make the view outstanding apart from unique. If you think the hundreds of years needed for the hand of man to create all these it makes it all so exceptional! 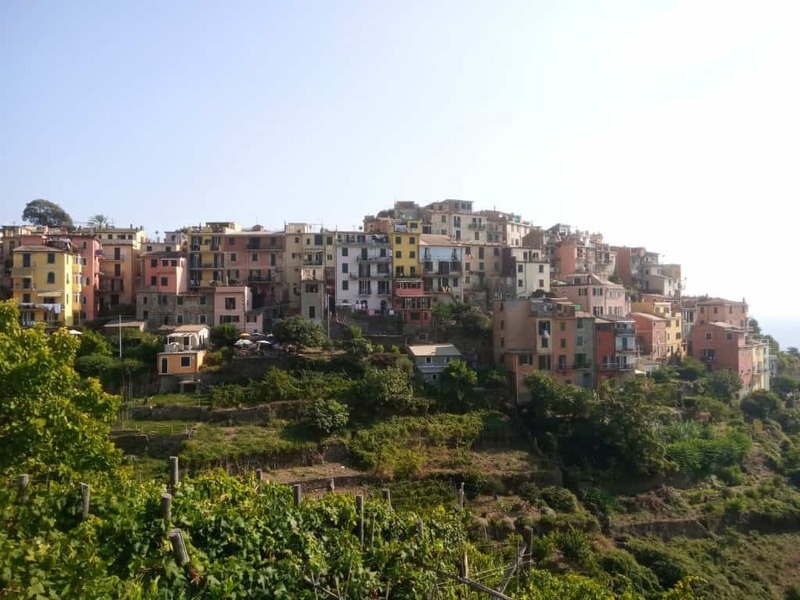 As well we could take the first glimpse of Manarola. Have a look below. After passing from among the vineyards without of course missing to taste some grapes (miam miam!) we, at last, got close to Volastra. 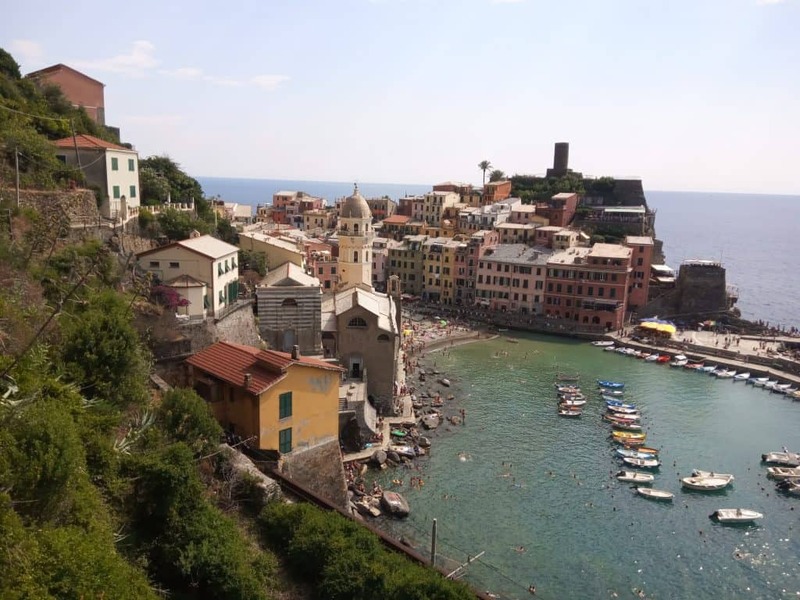 Volastra doesn’t belong to the Cinque Terre and in fact is nothing exceptional. 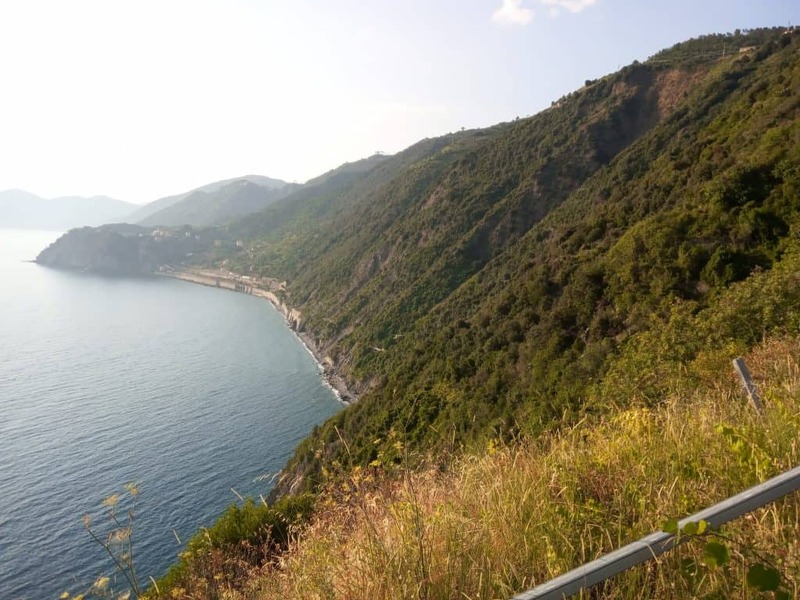 It just gave us the chance to just drink a little water again before we start heading downwards to Manarola. Going down was really long and much more tiring than what I was expecting. When the legs are tired every step downwards is hard due to the pressure on them. We started following the stairs that were looking like thousands to me. 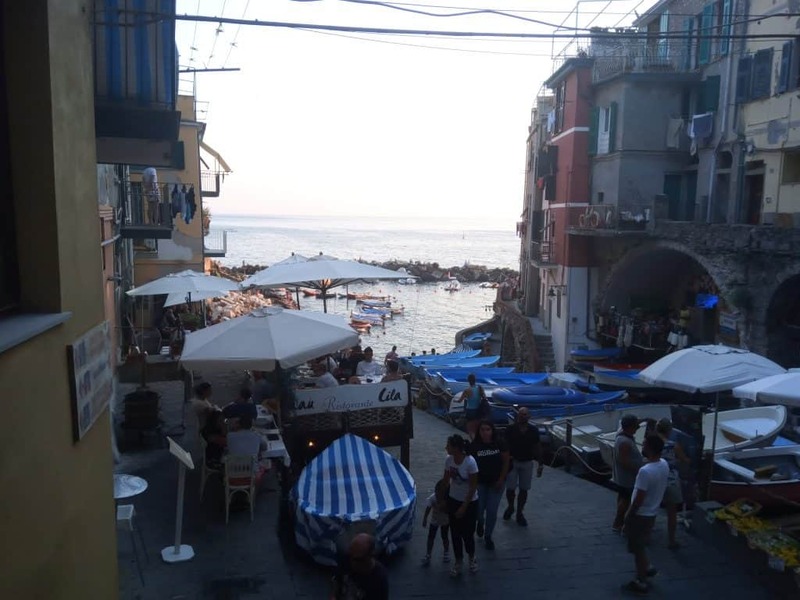 However, soon Manarola appeared and it was looking so close that again I couldn’t hold my pace when striding down. The closer it was looking the more excited I was becoming. This was making it hard for Niki to follow so every once in a while I was stopping to wait for her. While the view from the other side was also exquisite. And at last we were there! 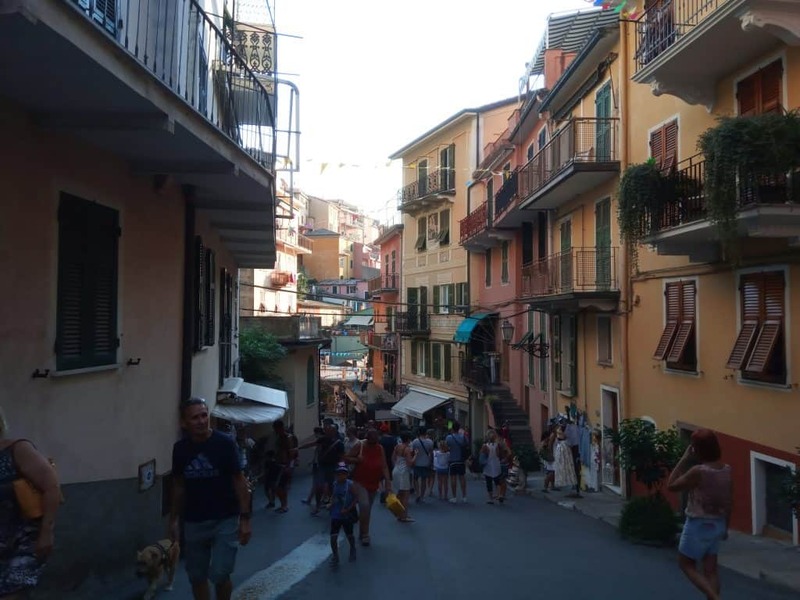 Walking in the main road of Manarola, the 4th of the 5 Lands. In there Niki went to a shop to buy a juice while I bought a bottle of water. 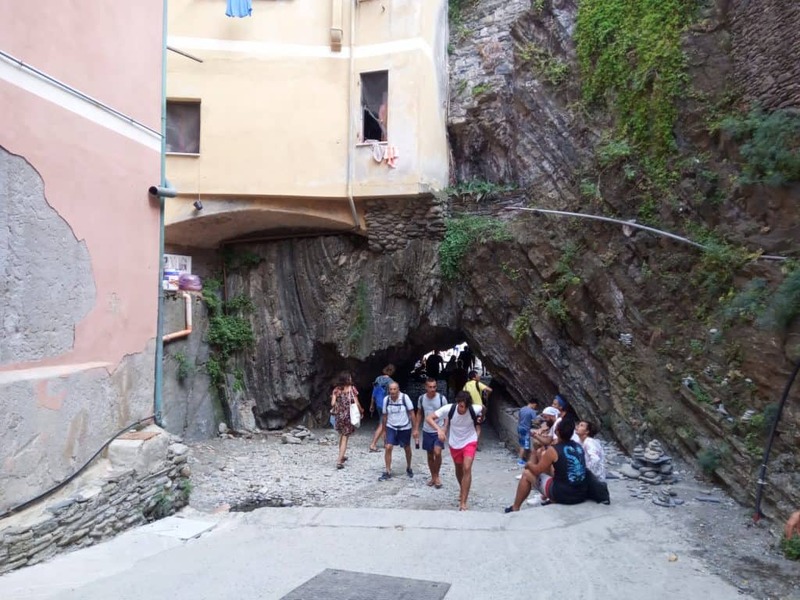 We asked the owner which way to go to Riomaggiore in order to be ready after we see Manarola. 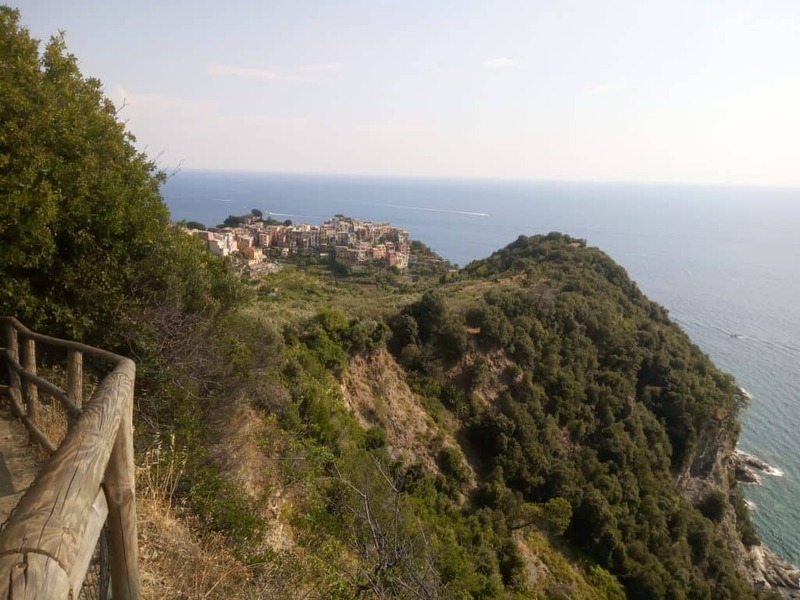 He explained that unfortunately, the only way to go was by train since once again the hiking path was closed and there was no alternative one, unlike the connection to Corniglia. After leaving it certainly didn’t take us much time to approach the port. 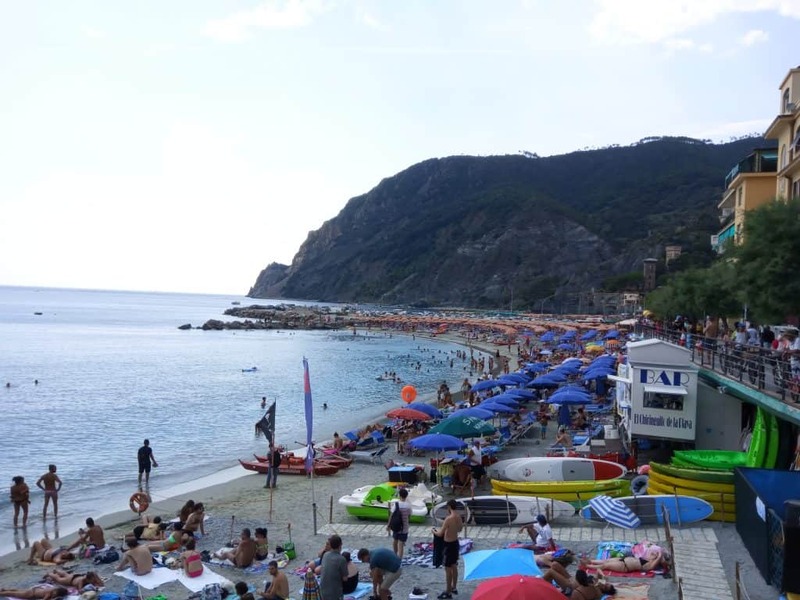 It was another typical Ligurian beach. 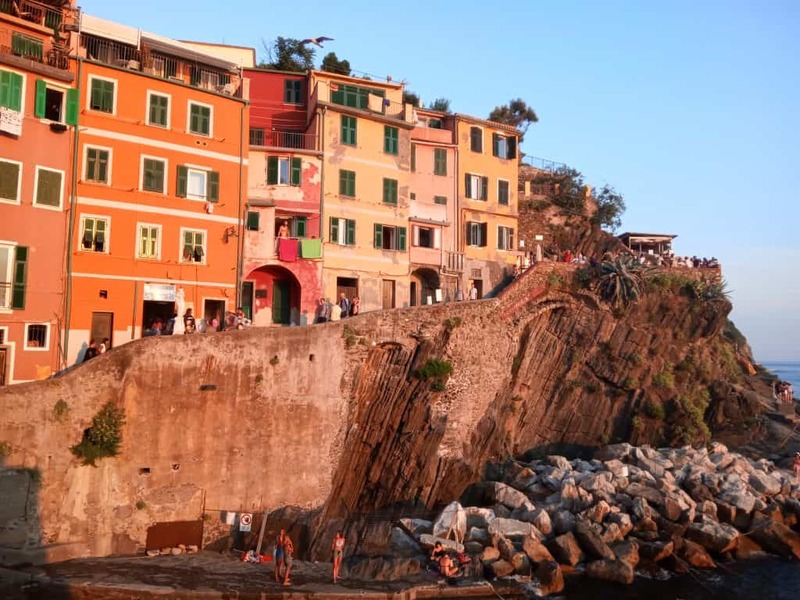 A narrow one with people standing on the rocks enjoying the sun and the water among the colorful houses. 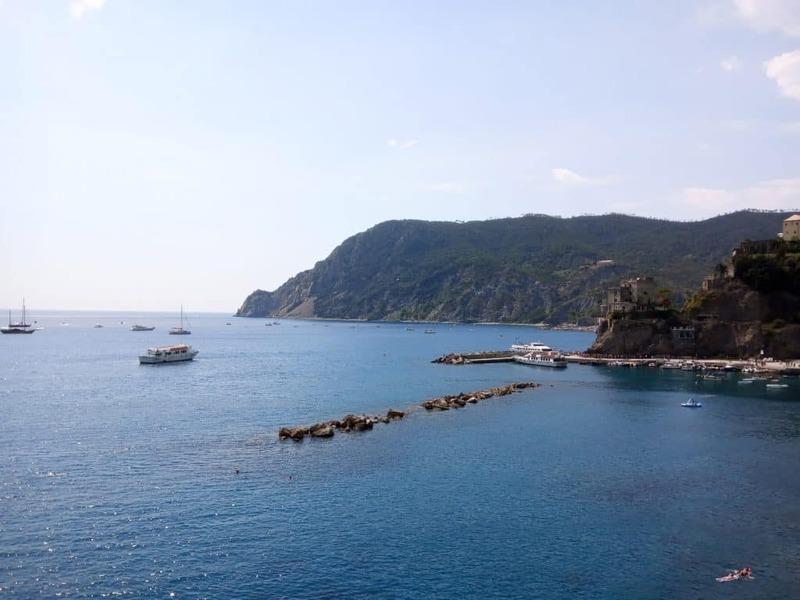 We followed the route around the port and reached the point that we had an absolutely fantastic view of the village. I don’t usually take many photos of myself as I give much more importance to the views however I couldn’t miss taking one there. 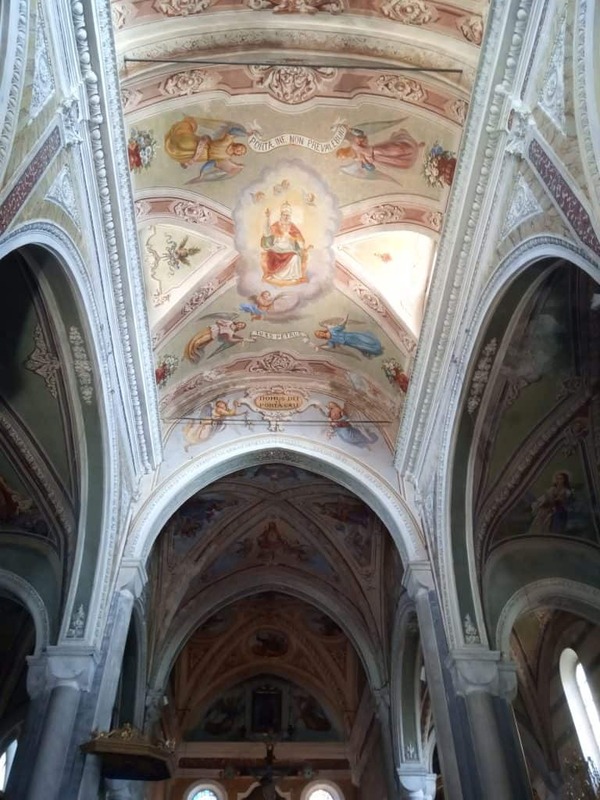 After we immersed our hearts and senses with such beauty we headed towards the train station. 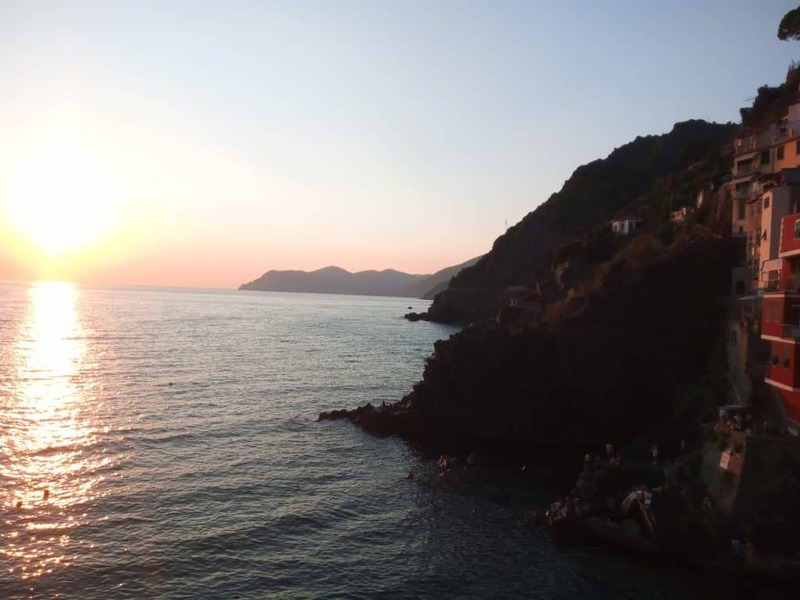 It was getting late (the sun would soon set) and we wanted to find a place to eat back in Genova which was about 2 hours away. 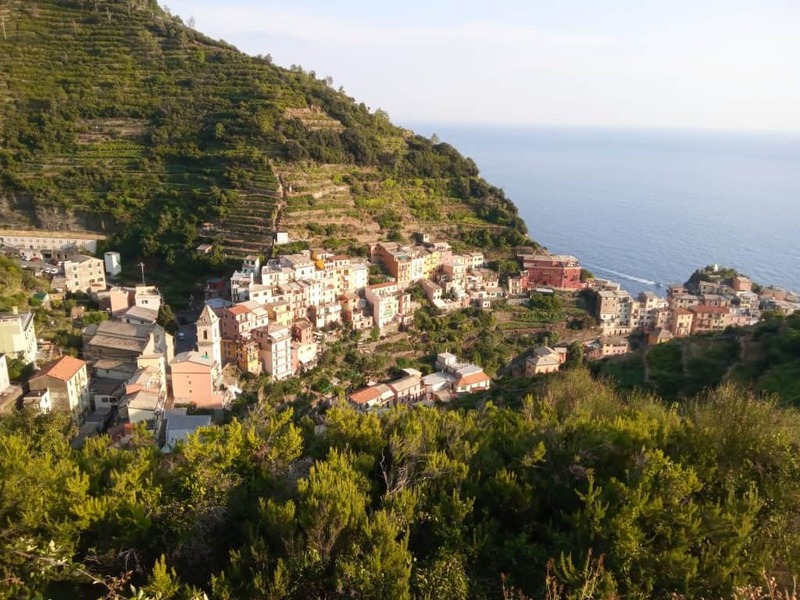 Simultaneously it wasn’t possible to hike anymore while Riomagiorre is similar to Manarola. 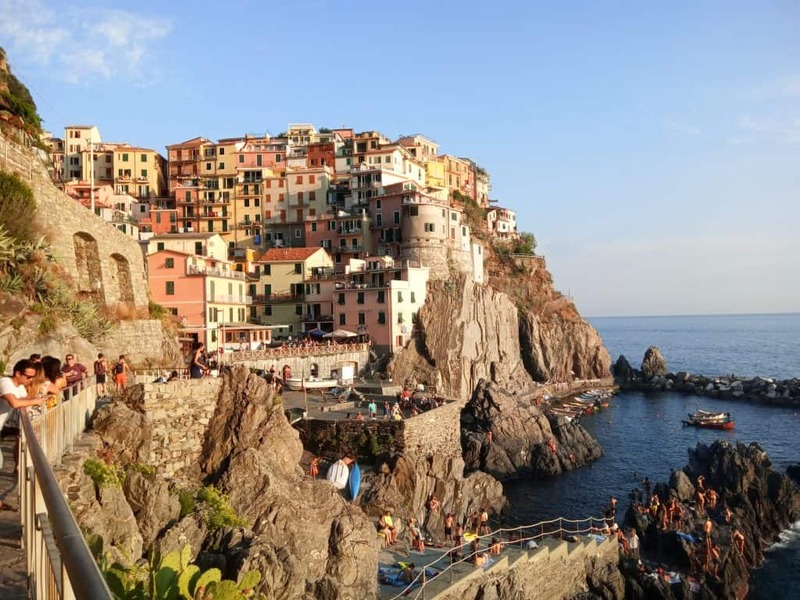 Thus we were planning to head back to Genova from Manarola. These thoughts I expressed to the kind ladies responsible for the tickets in the station. They searched quickly in the train times and they told me that we were lucky. 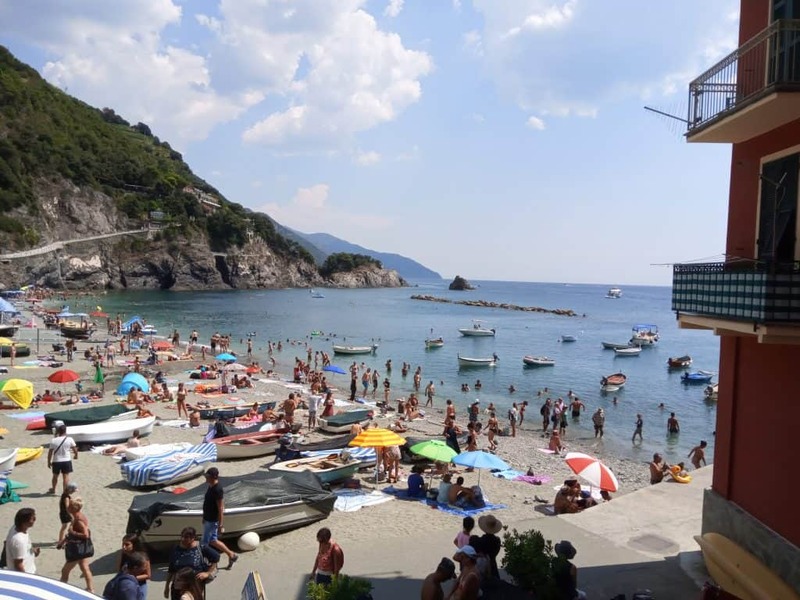 It was possible to go to Riomagiorre straight away, stay there for just a quarter and then there was a train going directly to Genova. This was unusual since most trains go between Cinque Terre and then you need to change in order to go anywhere else you want. Obviously, this makes the journey longer. Of course, I took it as a message from the heavens. Clearly, I was meant to finish this route and see all 5 villages. Therefore I couldn’t miss such an opportunity. 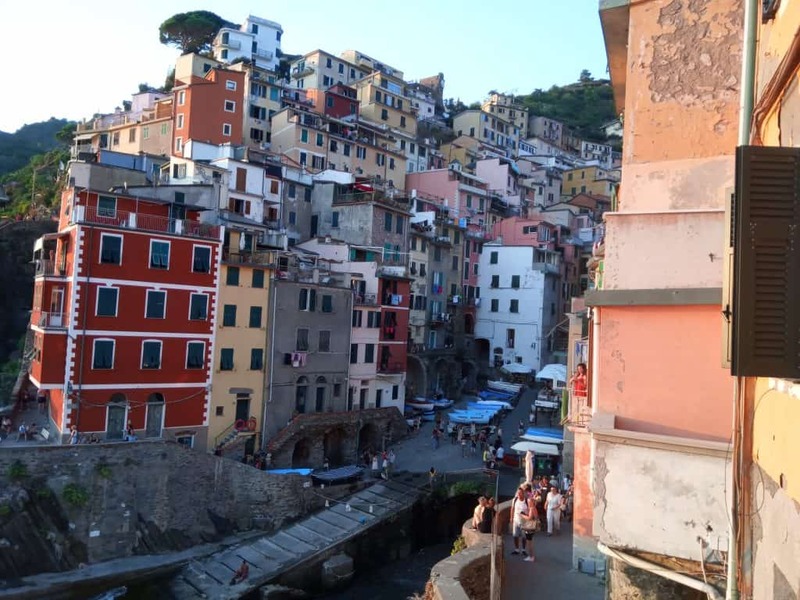 We got on the train, then, and 5 minutes later we were in the 5th village, Riomaggiore. 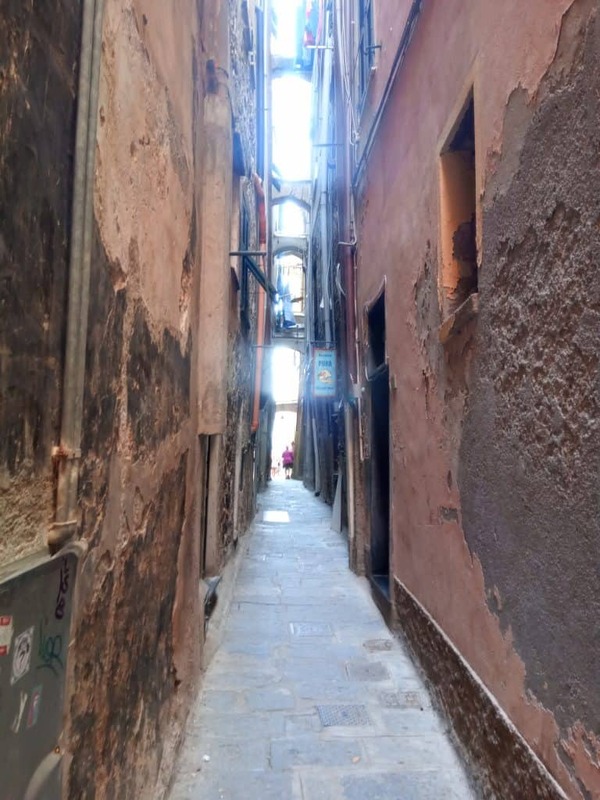 We immediately went out and bought tickets from there to Genova. I then looked at my watch. I had no more than 15min while the port wasn’t there, I had also to walk. 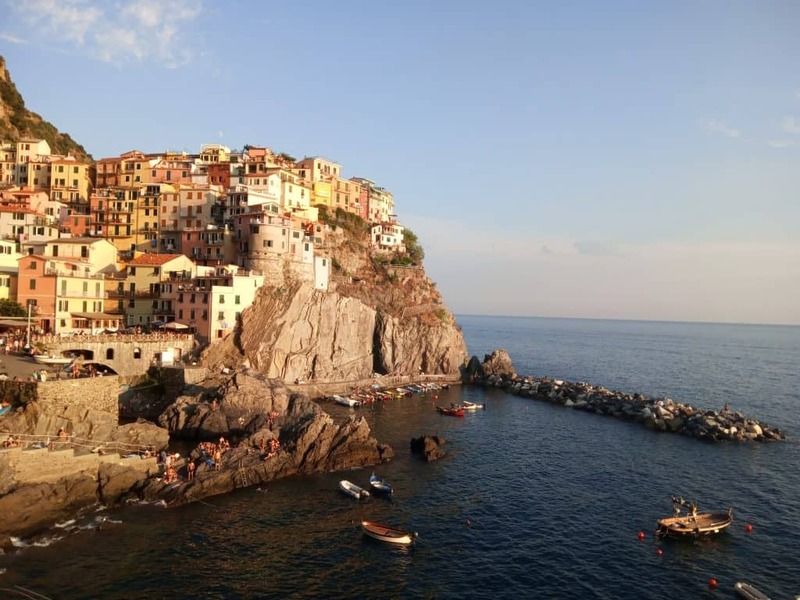 which indeed was similar to Manarola. 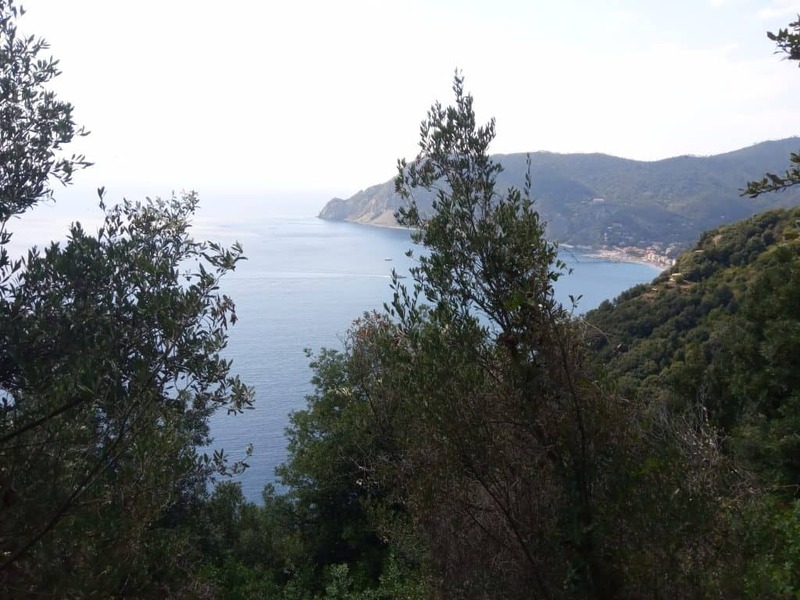 I tried to maintain a balance between control of the time and focus to enjoy the beauty of Riomagiorre. I had only a few minutes for this. 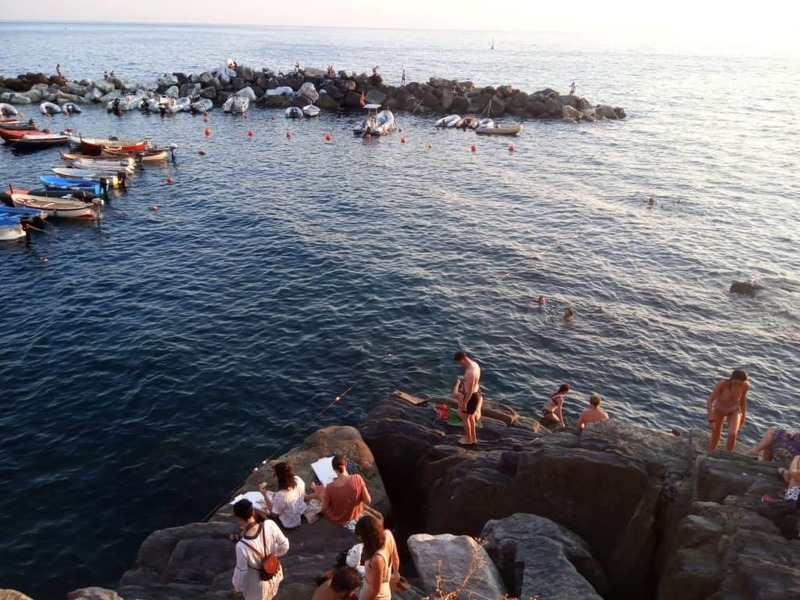 Here as well the people were jumping from the rocks or lying on them. 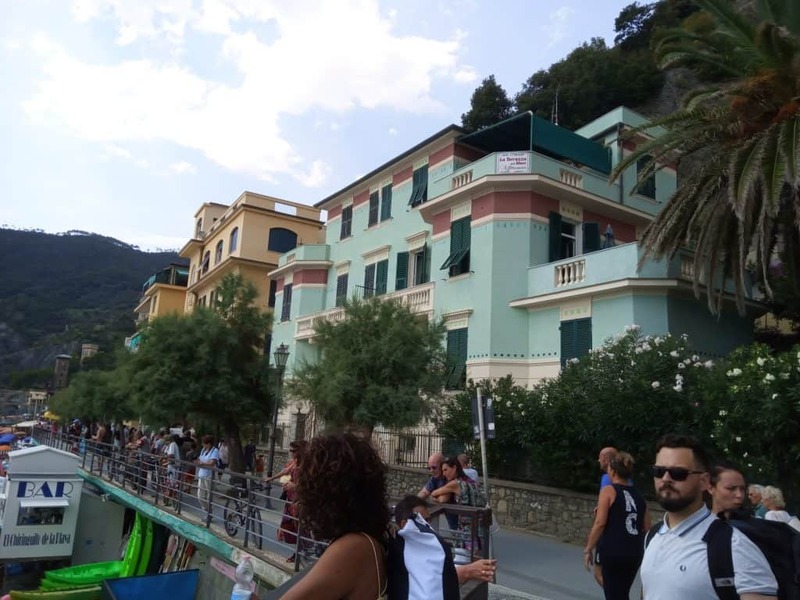 I quickly went on both sides of the port to enjoy all the ways this picturesque village could be stared. But of course it was time to go so without wasting much time I took the road back. 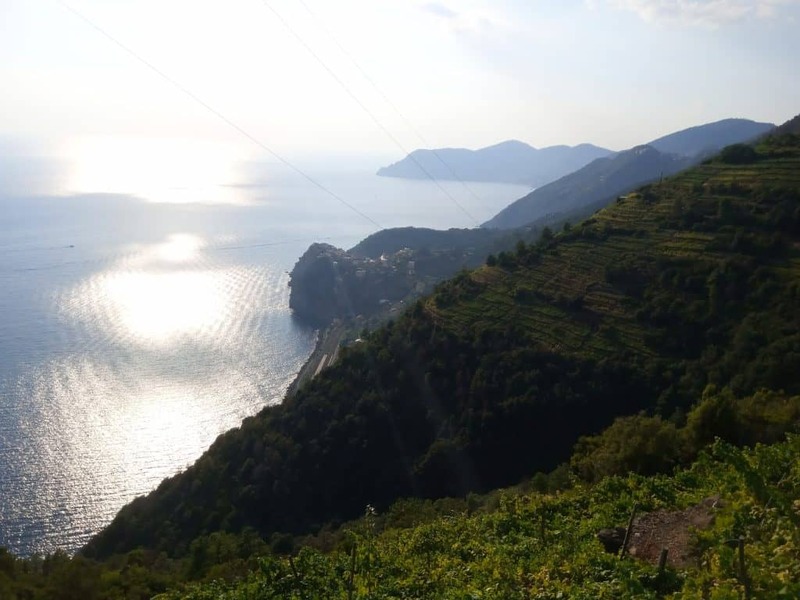 We managed, in the end, to easily catch the train being left with the unforgettable memories of the magnificent sunset of Riomagiorre and one of the most wonderful hikes we had ever experienced!